Here is my first topic on this site and like to start the first one with the Marmon. 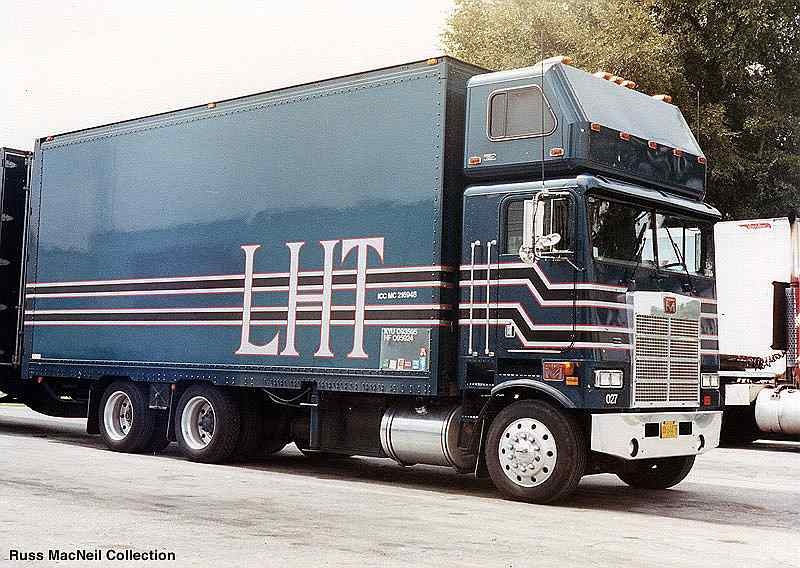 A while ago i was together with Jacobus looking at Hanks Truck Pictures and saw 1 picture what caught my attention. 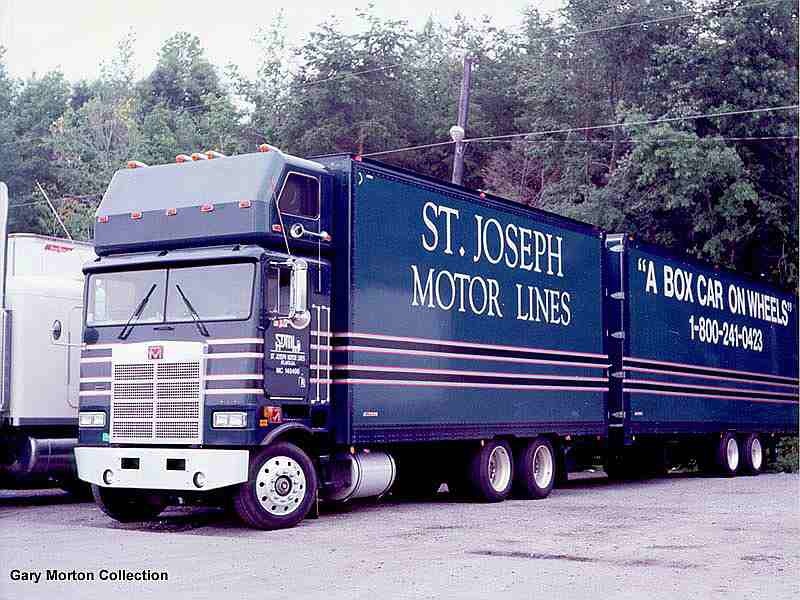 Its a picture from Gary Morton of the Marmon daycab with topsleeper from the st Joseph Motor Lines later i found one from the LHT company. 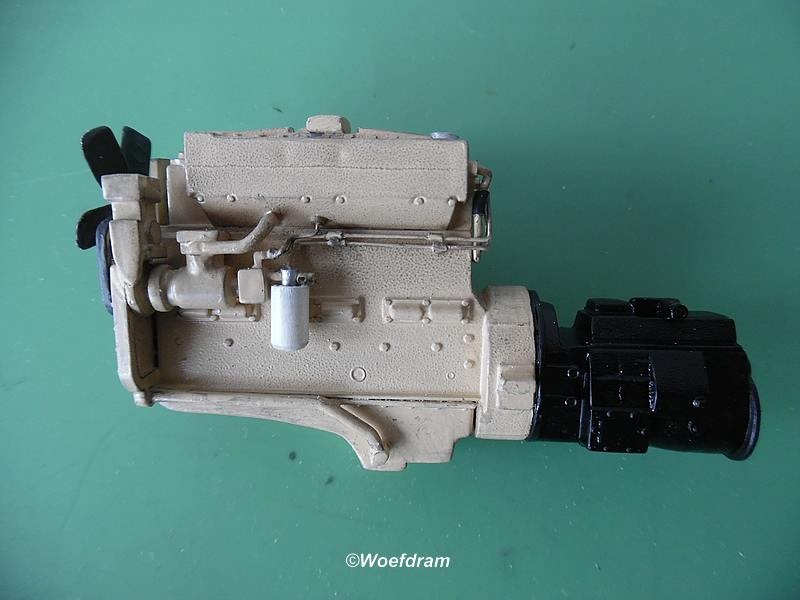 On this one the info is lacking, and i will build this model from these 2 pictures, atleast i give it a try. 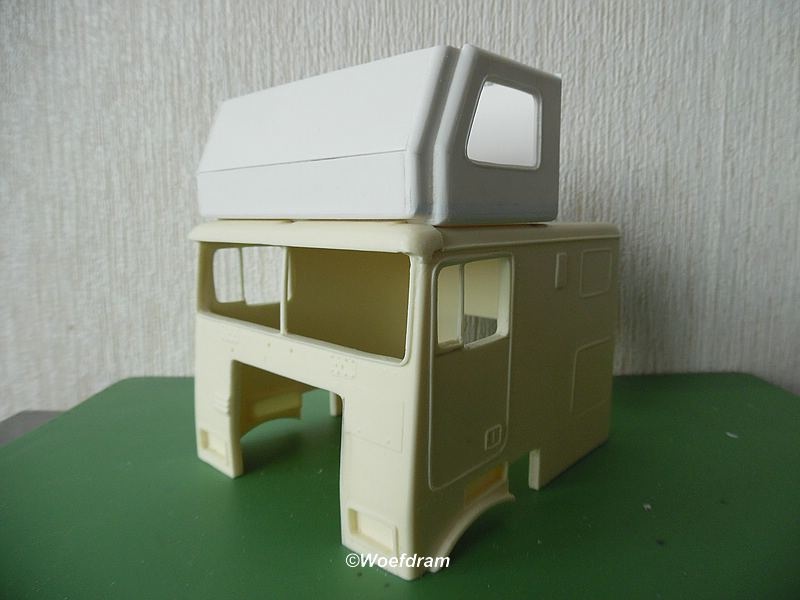 The first thing i did, was to buy the AITM double bunk cabine and cut this one to a daycab. 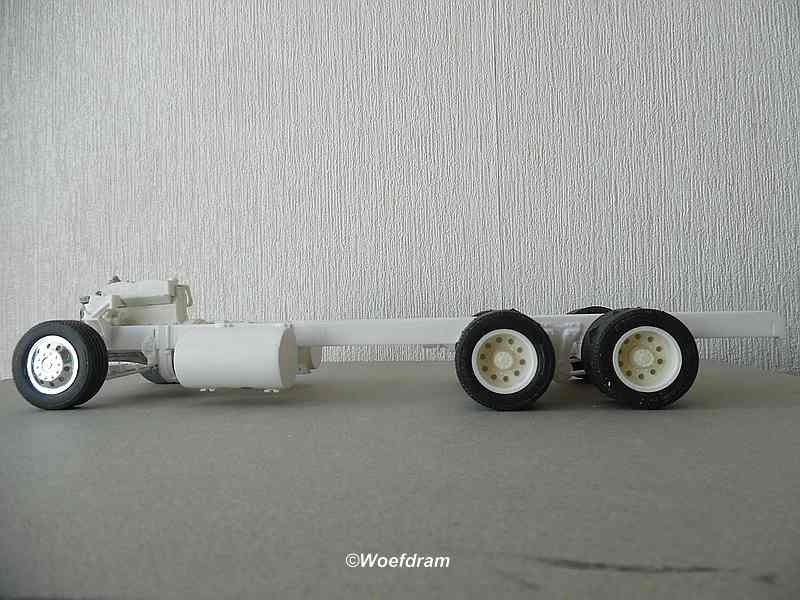 As a donor, i bought the ATM Papa Truck, because of the long chassis and the airsuspension on the double drive. 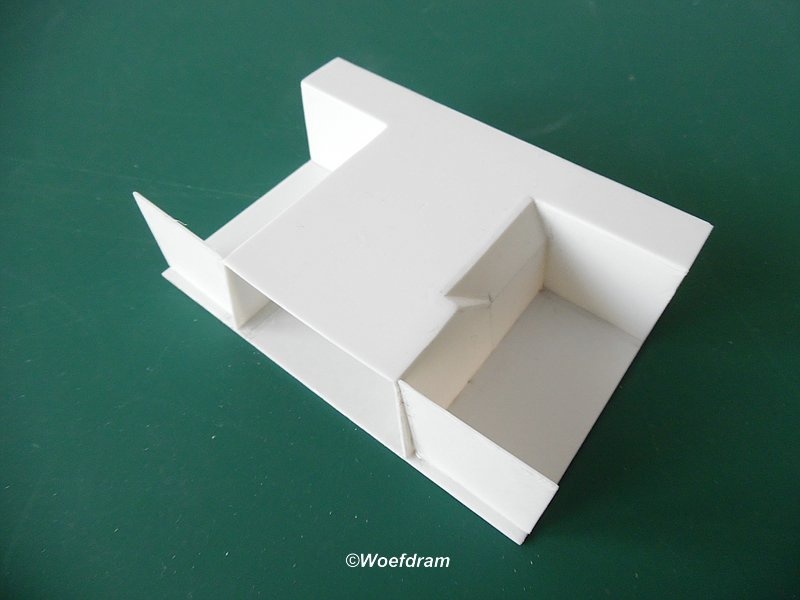 After looking at the cabine i decided that it was not an option to cut this cabine. 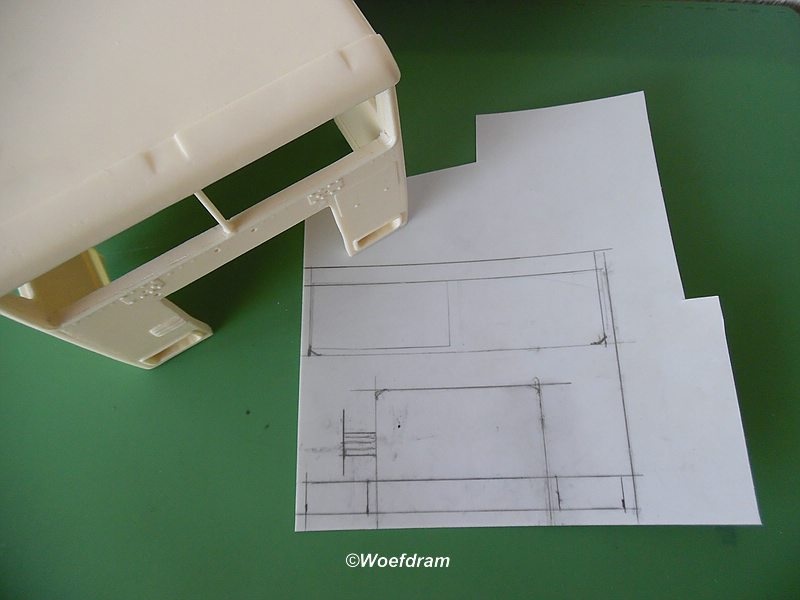 The next idea was to scratch the cabine with styrene and use this cabin for the dimensions and shape. 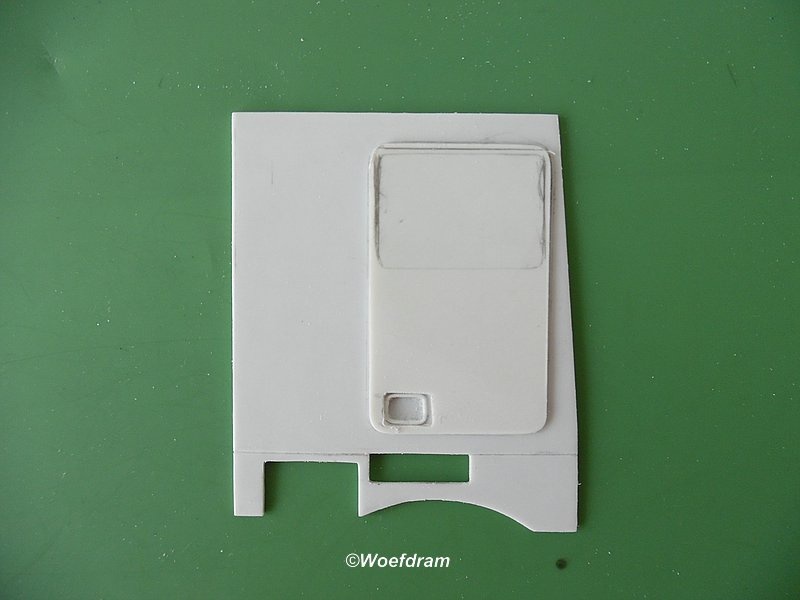 Here the start of this project. 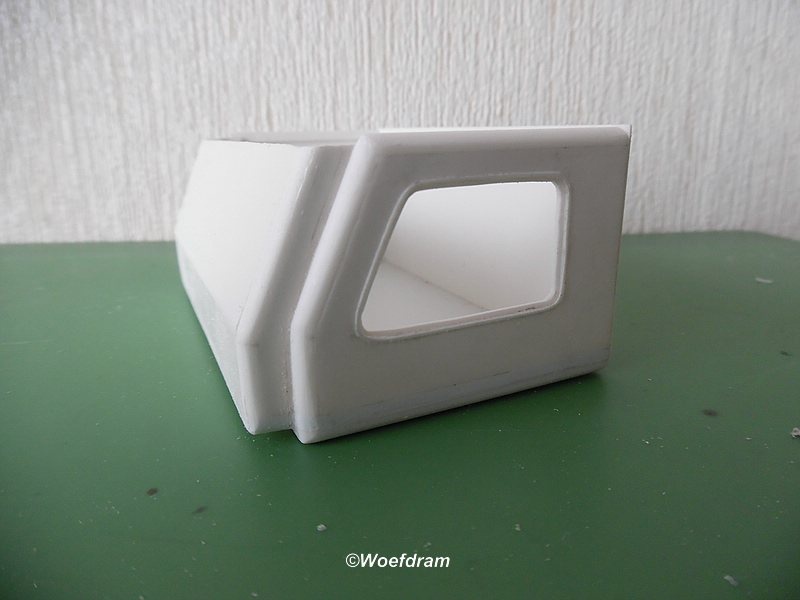 For the doorframes, i made a little smaller door so that the styrene strip of 0.5 mm can be glued around it without any unwanted bends. For the rivets i'm waiting for a Punch & Die set that i recently ordered for this kind of work. 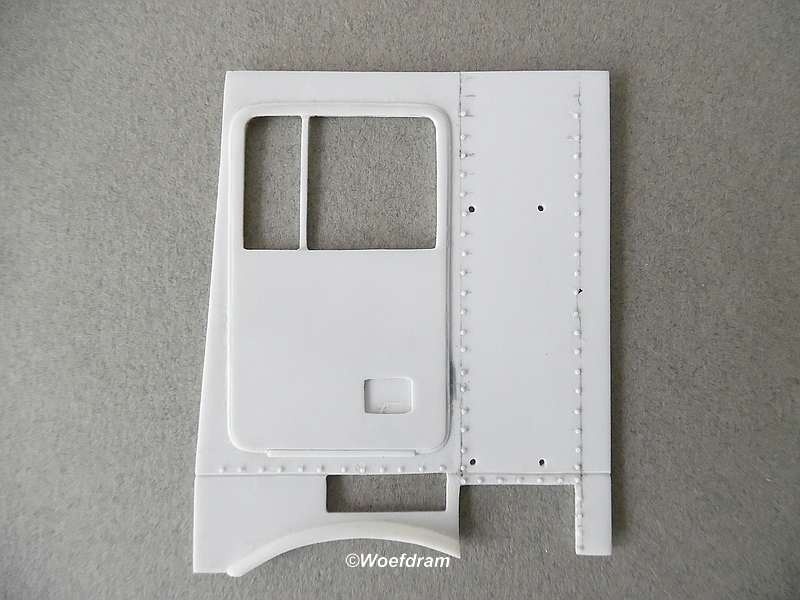 After these rivets are placed, than i can start to glue the cabine parts together. 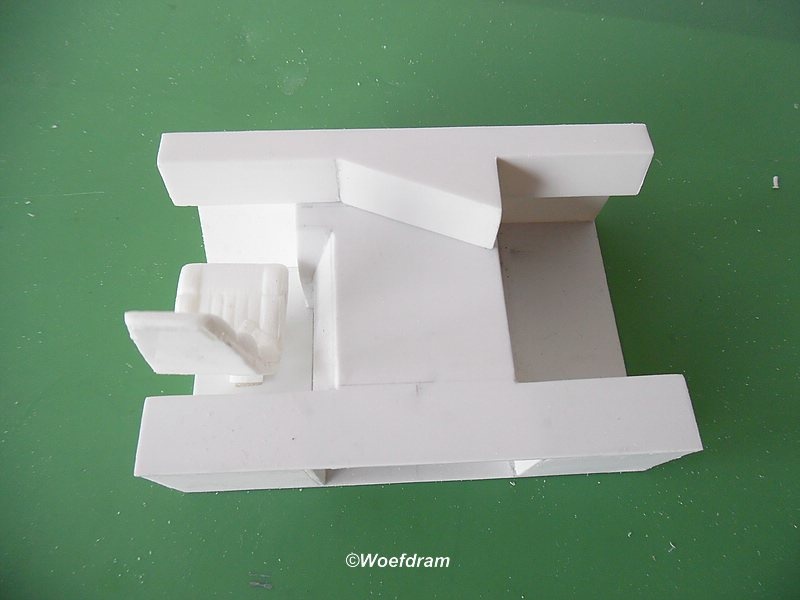 For now i continue with the bottom plate and engine tunnel. 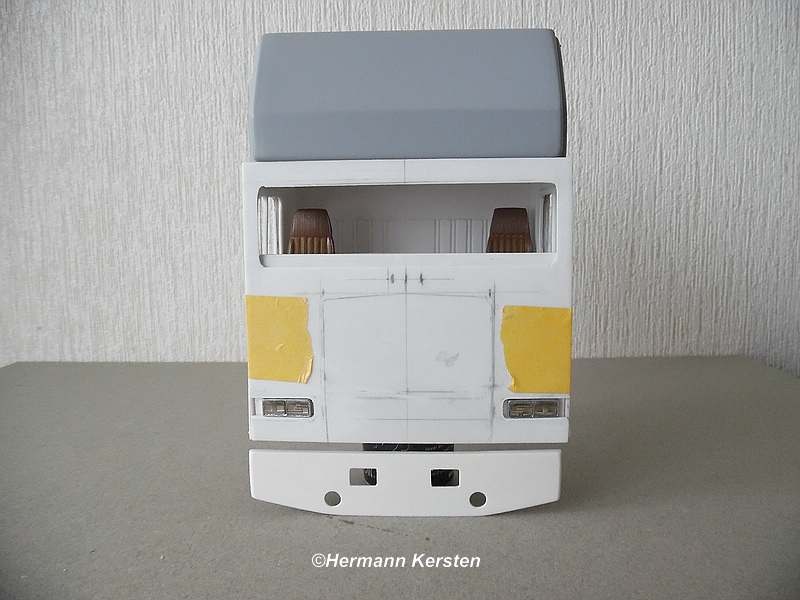 I hope you like this project and any kind of info of this truck will be very welcome. Wow what a great project! 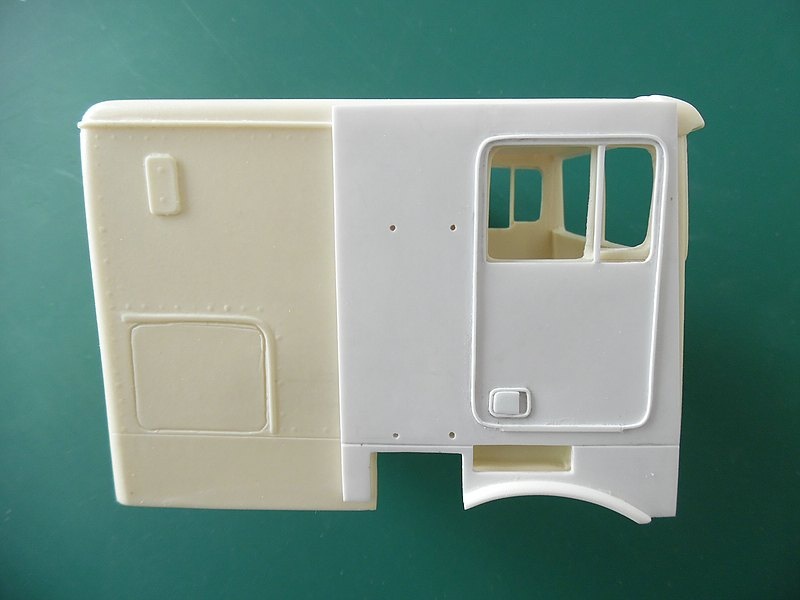 I’ll be following along to see how you scratch build the cab. Thank you Dan and Clayton. 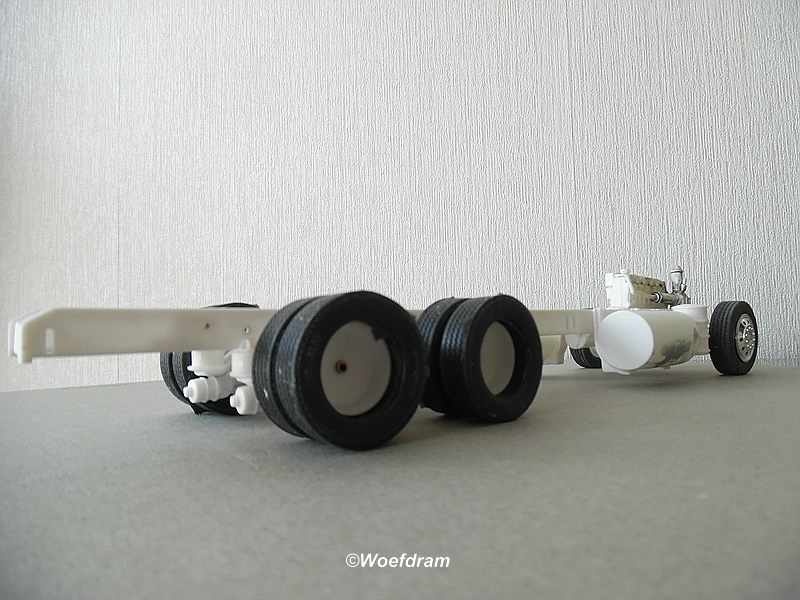 Today its time to see the start of the chassis with the modifications. 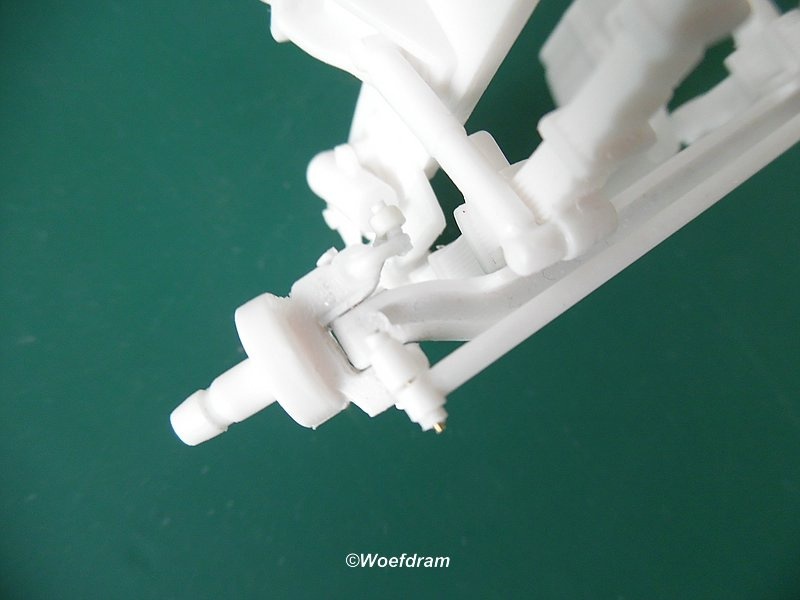 The first important thing, is to get the double drive axle in the right place, this was a bit of comparising on the basis of the st Joseph Motor Line picture. 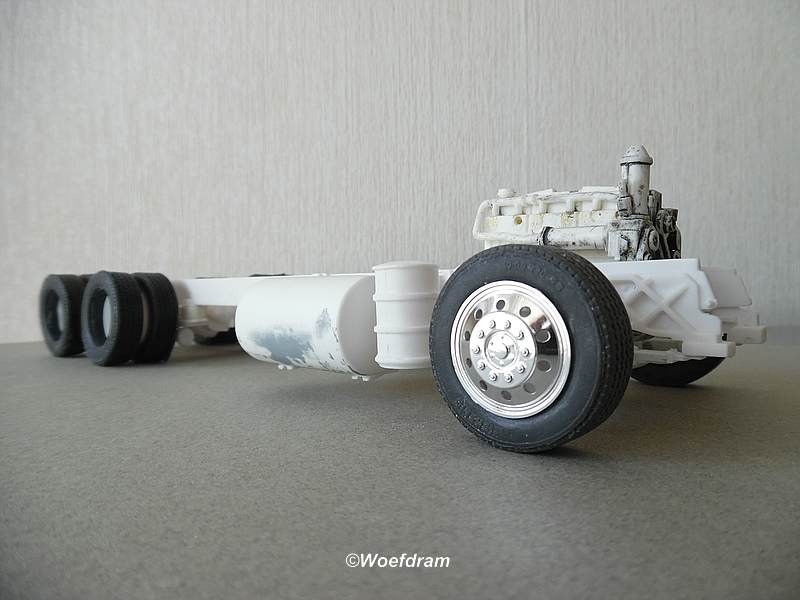 Afterall, the double drive fits about 1,5 times between the front axle and the first rear axle. 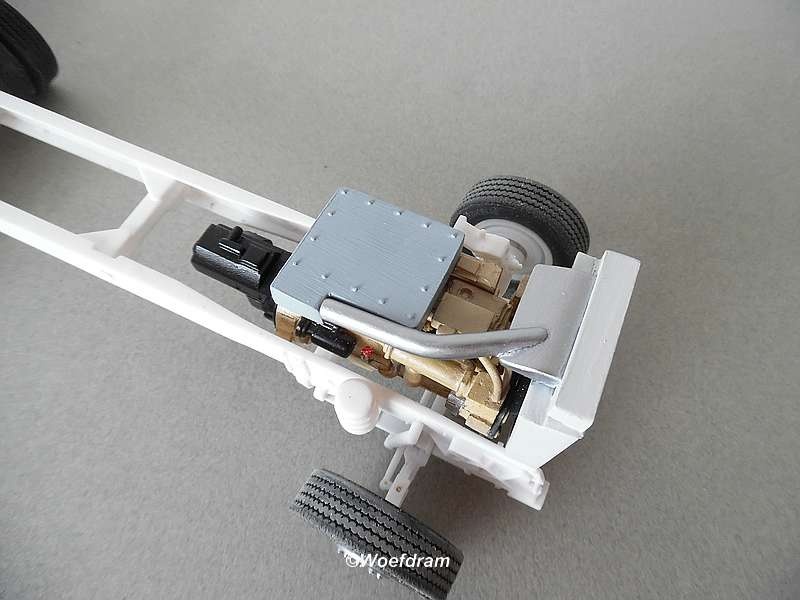 On the ATM chassis it means that the double drive need to be 3,5 cm moved to the front. 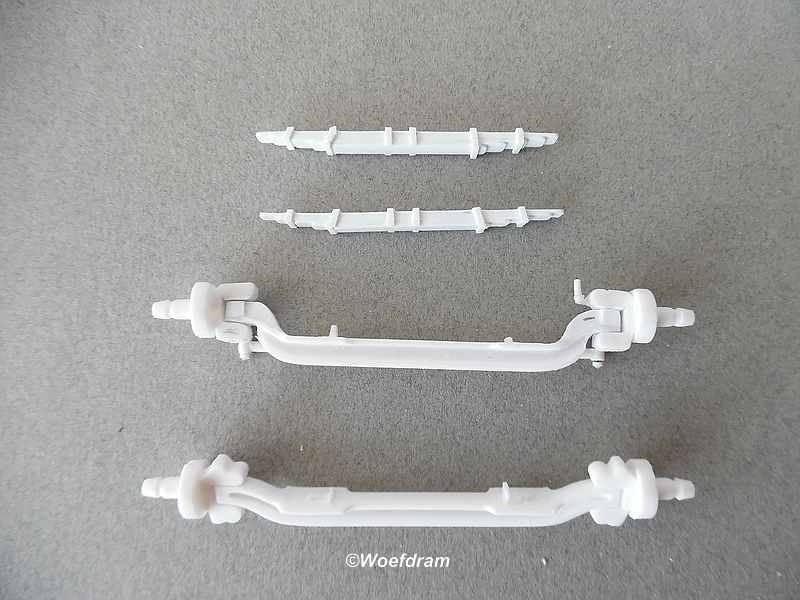 Than remove the plastic axle clips and drill the right axles through and through. 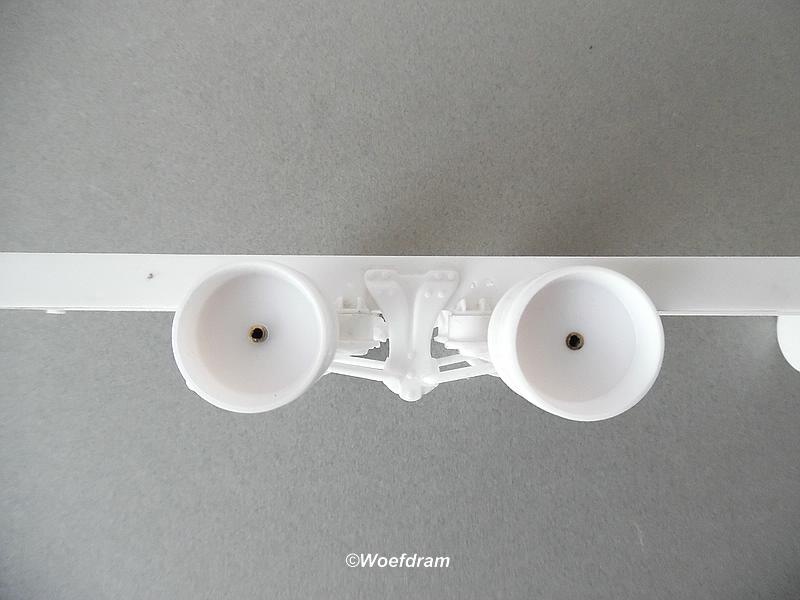 Then replace these plastic axle clips with a brass tube, so that the model is always straight on its wheels and you don't have the risk that on later term a shaft bends or breaks off. 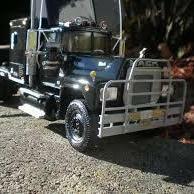 I'll do this to all of my truck models. 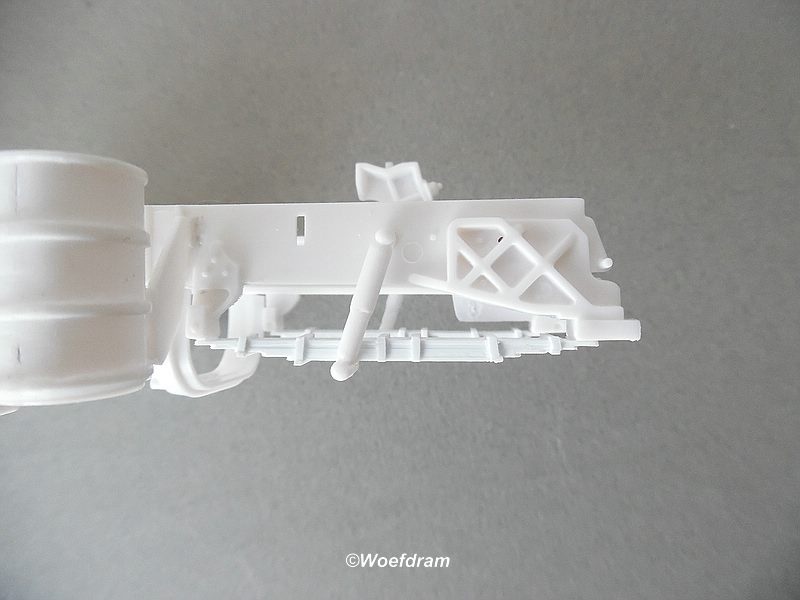 The chrome rear wheelrims are de-chromed with oven cleaner, because i will paint them later in a white colour. 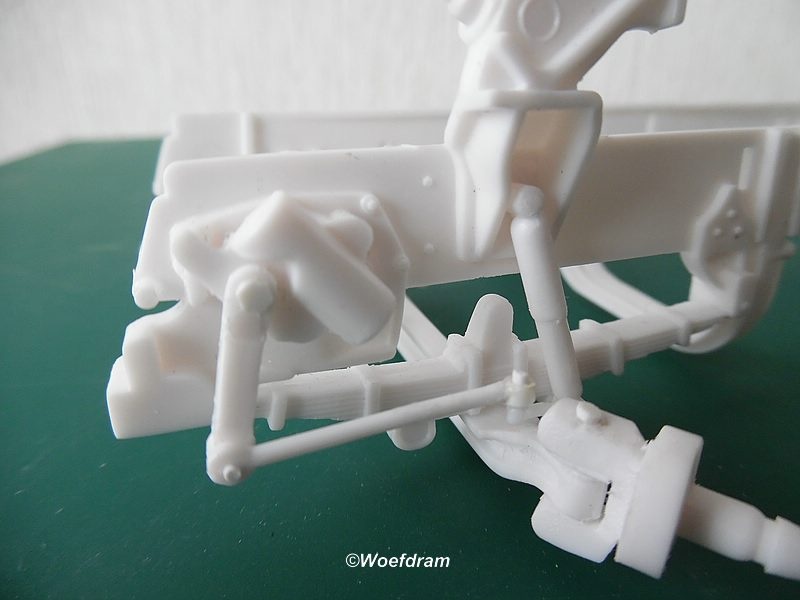 The next job is to make the front axle steerable. 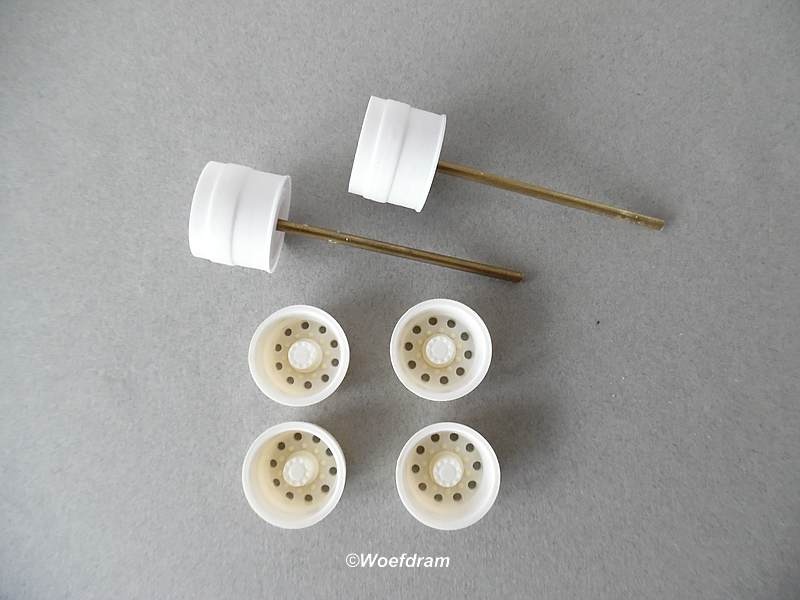 First i drill the holes in the weelhubs, than cutting and replace them with brass pinns. 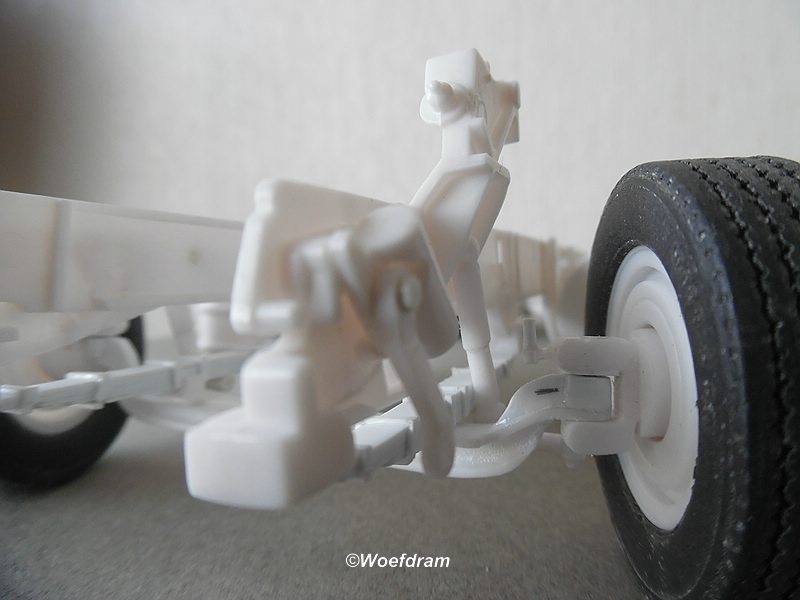 After this one i remove the engine supports in the frame, because the papa truck has a V8 engine, and the marmon is getting a Cummins 6 in line engine. 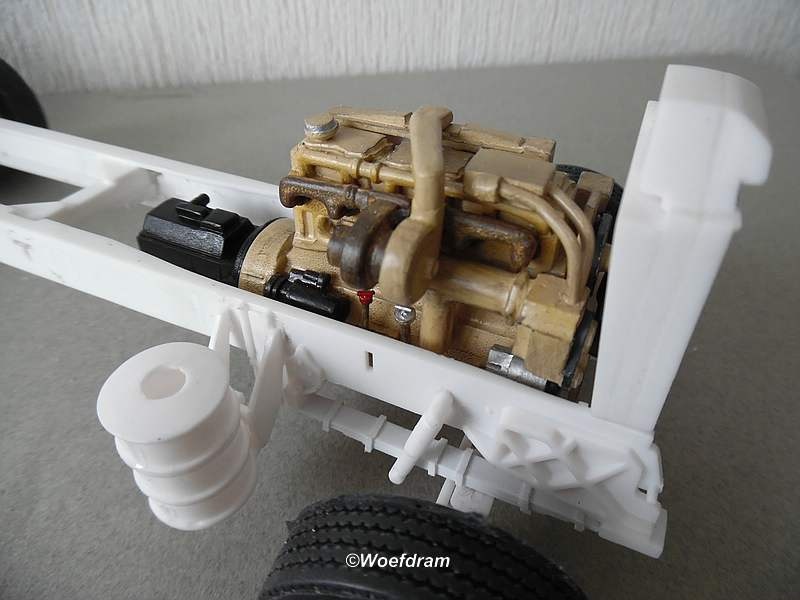 This engine fits good under the cab and does not extend behind the cab. 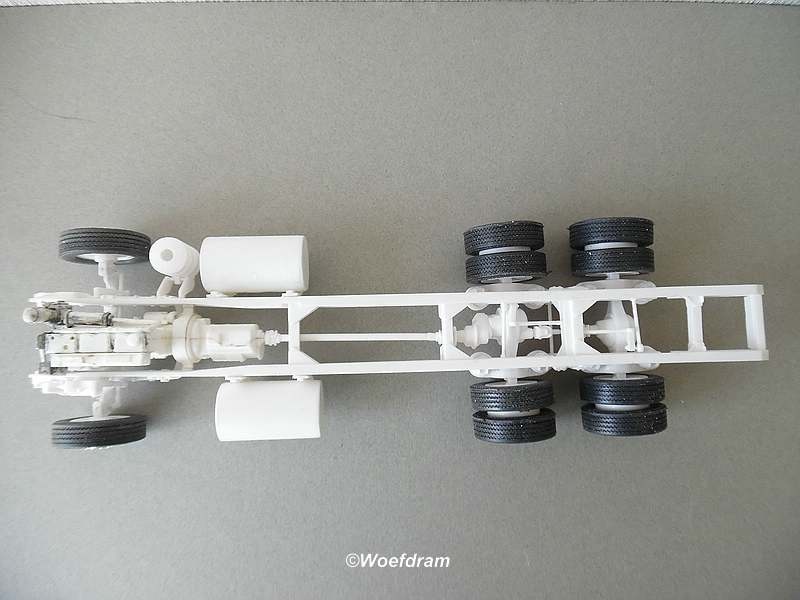 Then place the engine and shortened drive shaft between the chassis, together with the rubber tires from the kit , to see the proportions. 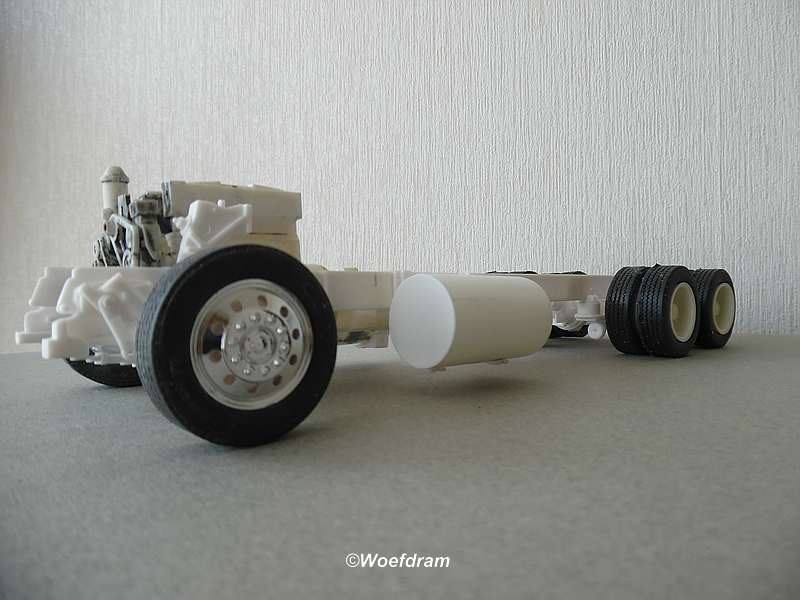 Below I show the difference between the tires, in front the low profile tire and on the rear the normal tires. At last but not least, the bumper. 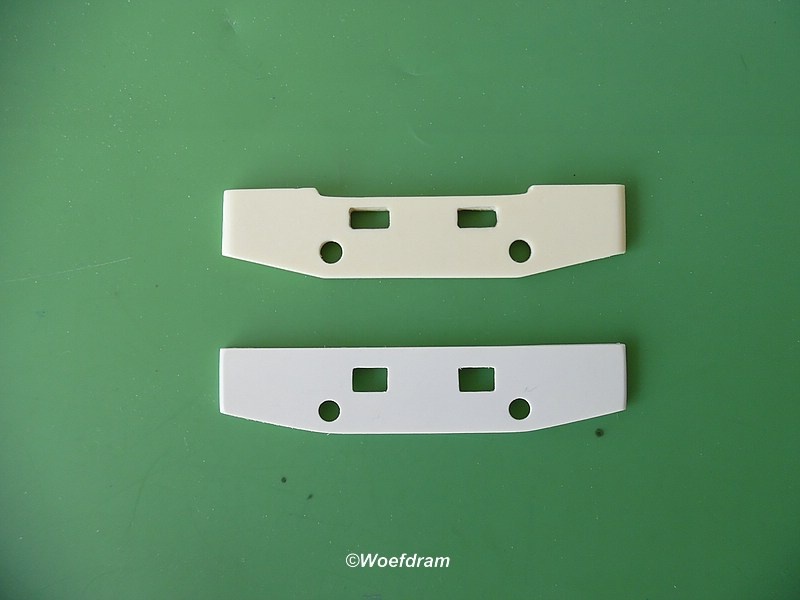 Above the resin bumper and below the styrene bumper. 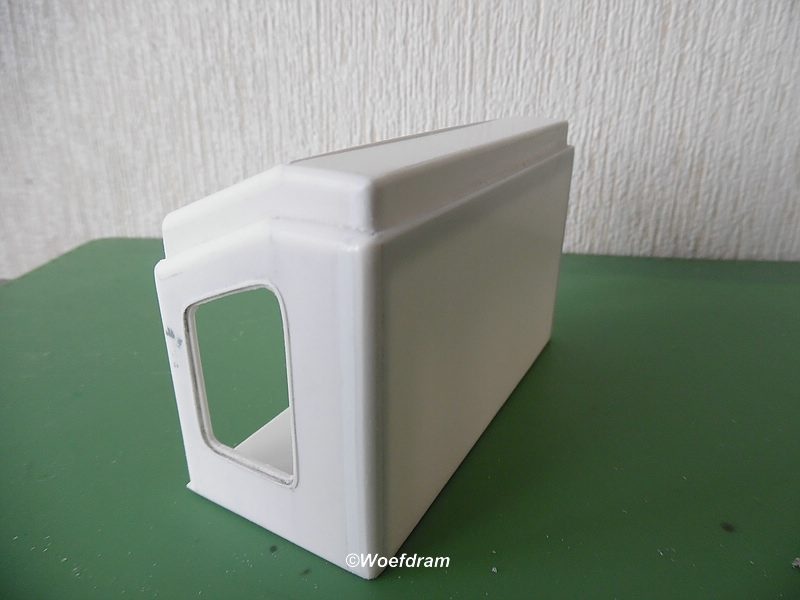 For the radiator I have to check whether the radiator of the Peterbilt is a better choice, because of the height.....im not really sure. 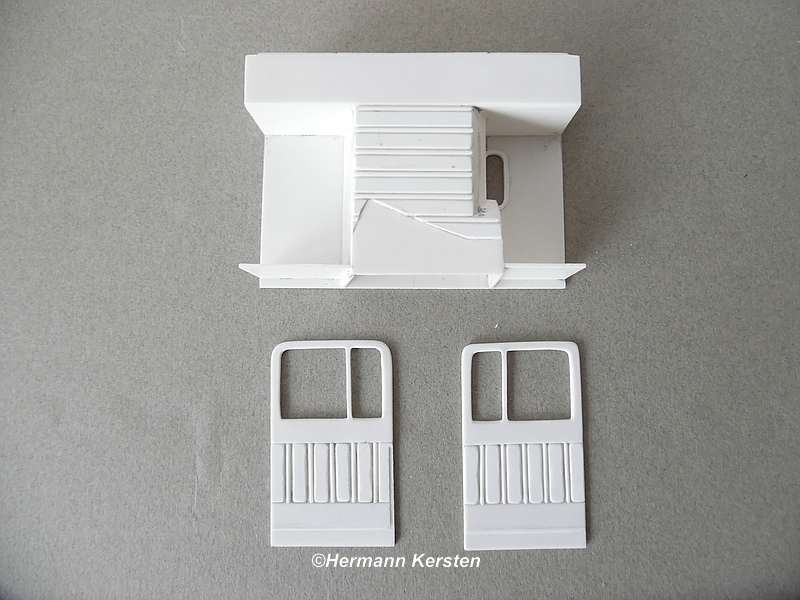 Hi Hermann, looks like we both have a liking for the unusual, its looking great, like you it was a toss up between buying the cab conversion or scratch building, and like you without any drawings and measurements the first option was a non starter. Mine is a more conventional build of course and won't need half as much work as yours but I had all ready decided that I would redo all of the riveting detail and other bits, the other thing of course is that I am a true Yorkshire man and now that I have bought this cab there is no way I would waste all that money for nothing, I am not dissing the cab kit, it must be one of the hardest cabs to cast in resin as it is really just a square box and really difficult to keep straight after moulding, the other thing of course is that neither of us would be getting anywhere without it. 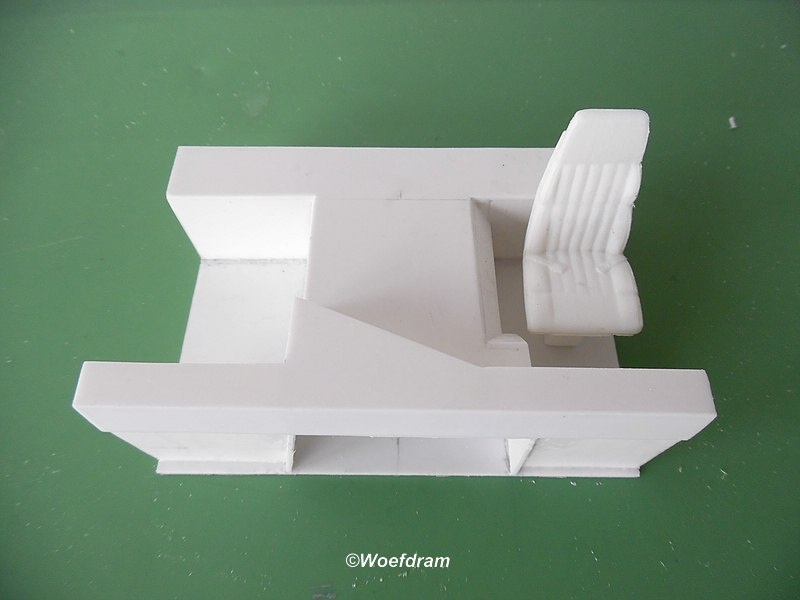 Anyway its great you are posting plenty of photo's, I will be following your progress with great interest and hopefully picking up lots of tips and ideas on the way, its looking good, carry on the great work, I think its going to be something pretty special when it is finished. Yes Geoffrey, u nailed it, this was exactley the same situation where i was in. Even im not a Yorkshire man, even i dont like to waste my money for nothing and in the worst case, ending up with nothing. 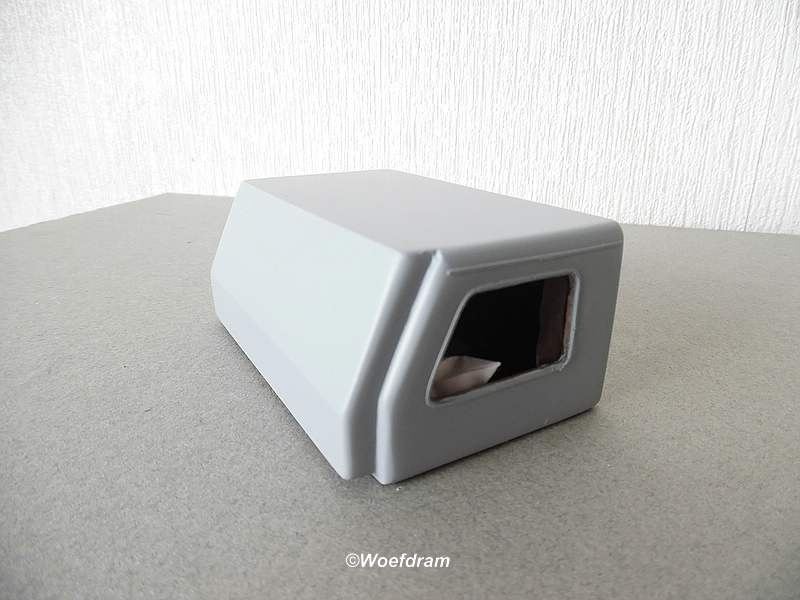 The other reason is, that i'm more experienced with styrene instead of resin and as you said, the cabin is a square box and in this case not that difficult to scratch. 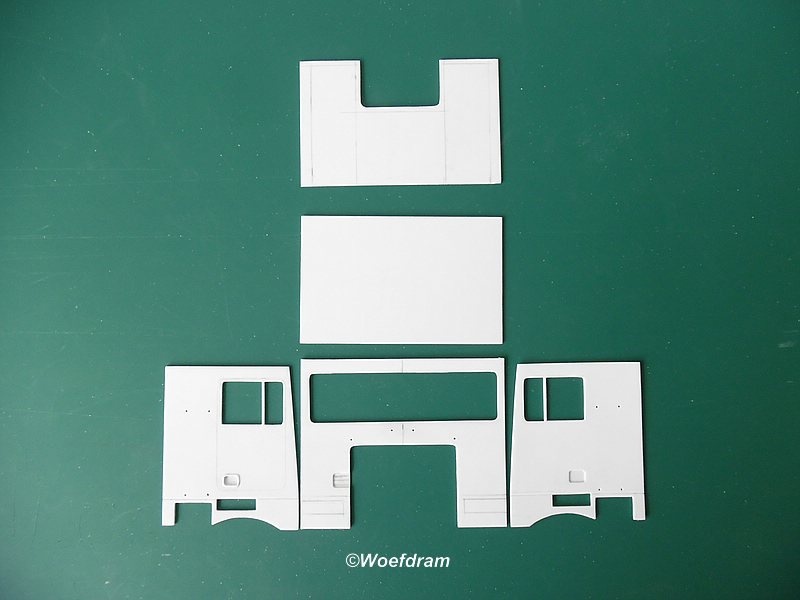 I scratch build a Fuso Super Great cabine before and that was a lot more work and more difficult to do than on this one. Very Impressive work!! Looking forward to more!! 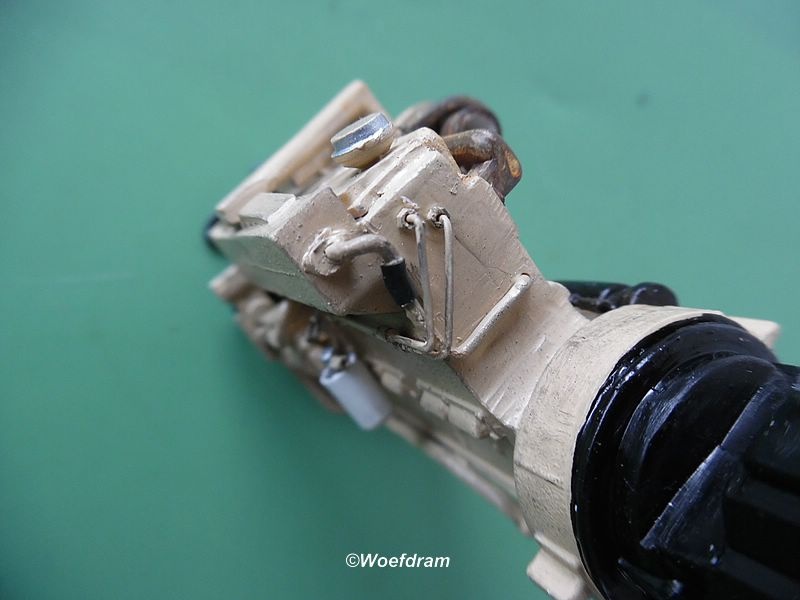 Very interesting build...............keep the photos coming!!! Brian and Tom, thanks for the comments and welcome aboard! 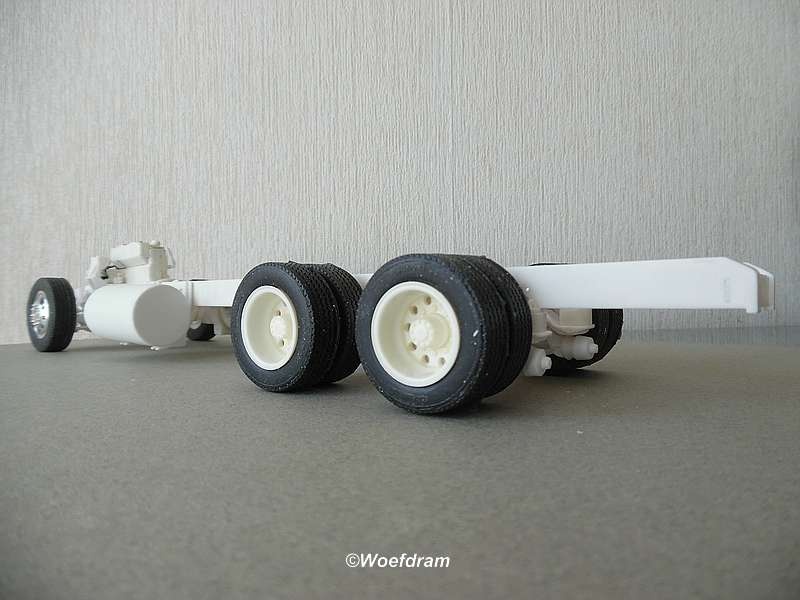 Today i show you the modification of the axles to get the chassis at the right height. 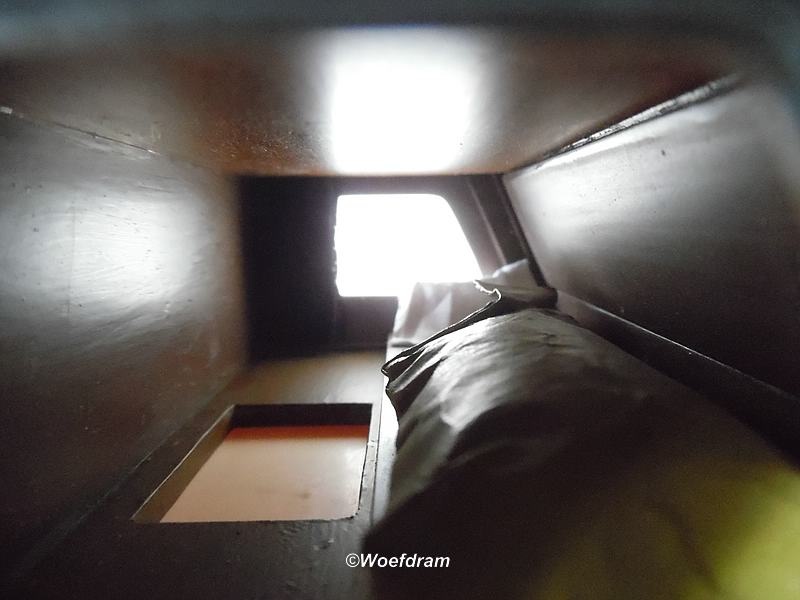 I determined this height of the photos, and took the distance from the bottom of the diesel tank to the ground as a reference. 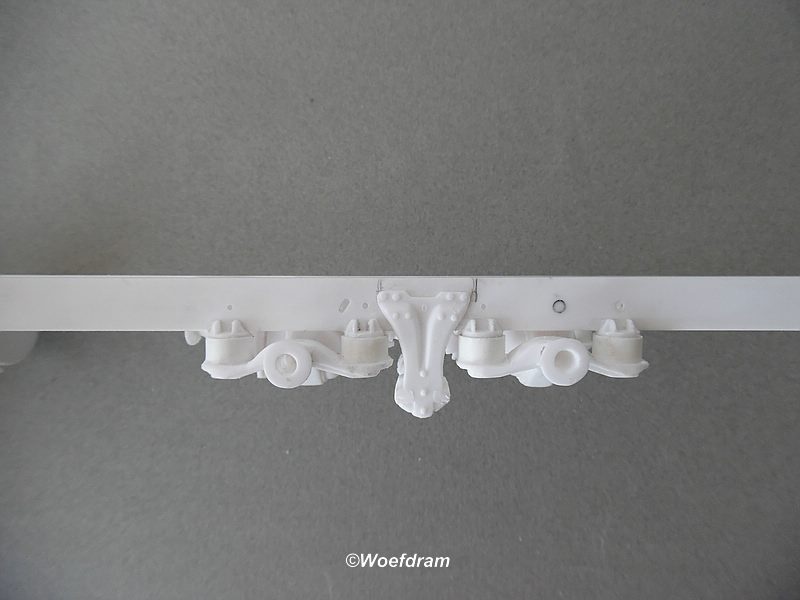 First of all i attached the tanks and the supports with double-sided tape. 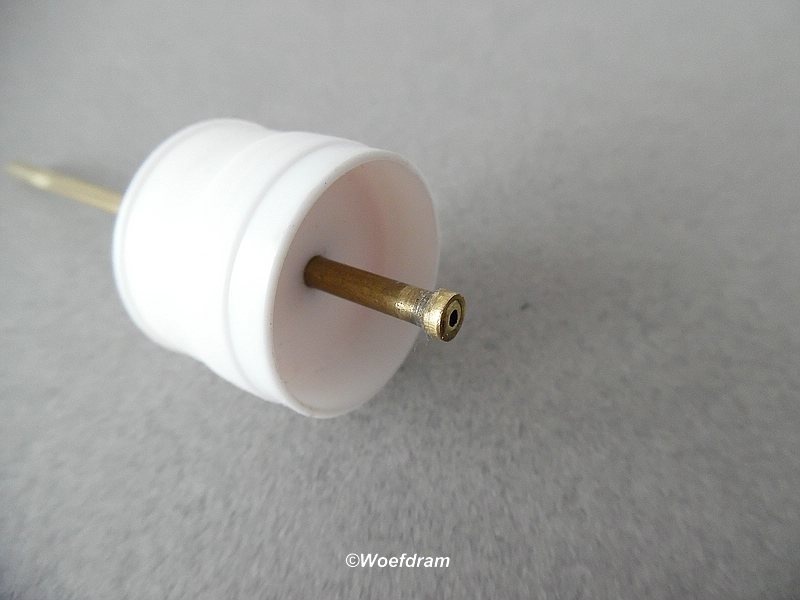 Then the shaft recesses of the air spring suspension are further sanded out, what gives me 3mm, and the air bellows removed, made new ones that are 2mm shorter, and place them at the chassis. 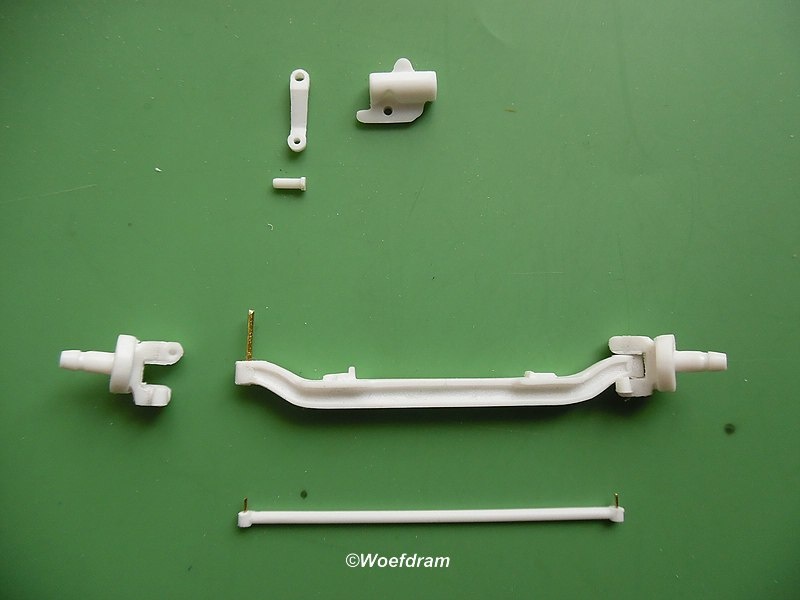 All parts are molded in one piece, like the brake boosters and torsion bars, cut away because these attributes are all coming into a different position, in relation to the lowering of the axles. 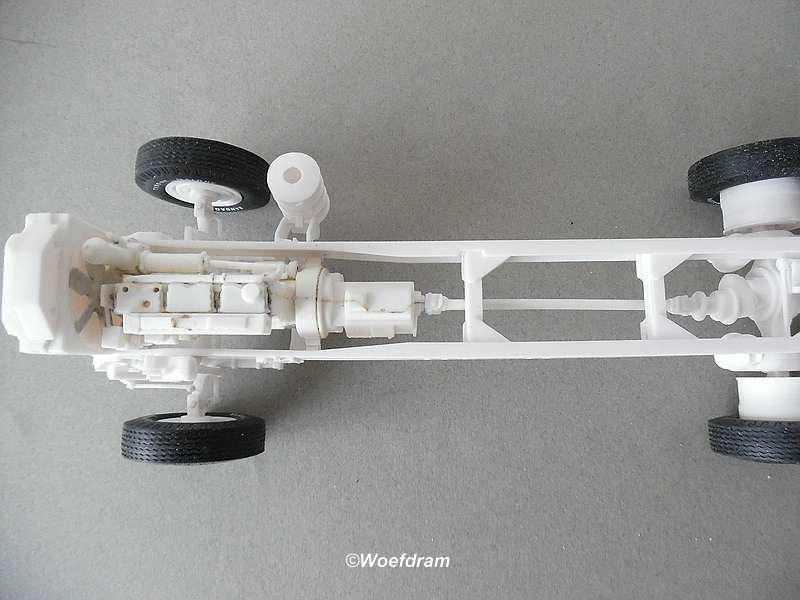 The front axle is also modified to a drop axle, what gives me 3mm, than cut the leafsprings, made new ones what gives me another 2mm and place all these self made and modified parts to see if the chassis is low enough. 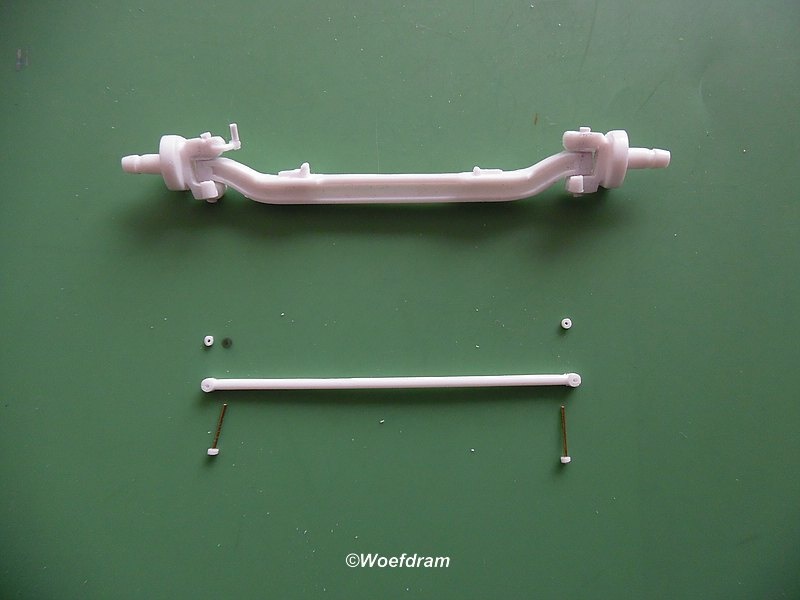 And afcourse, the shock absorbers has to be shortened also. 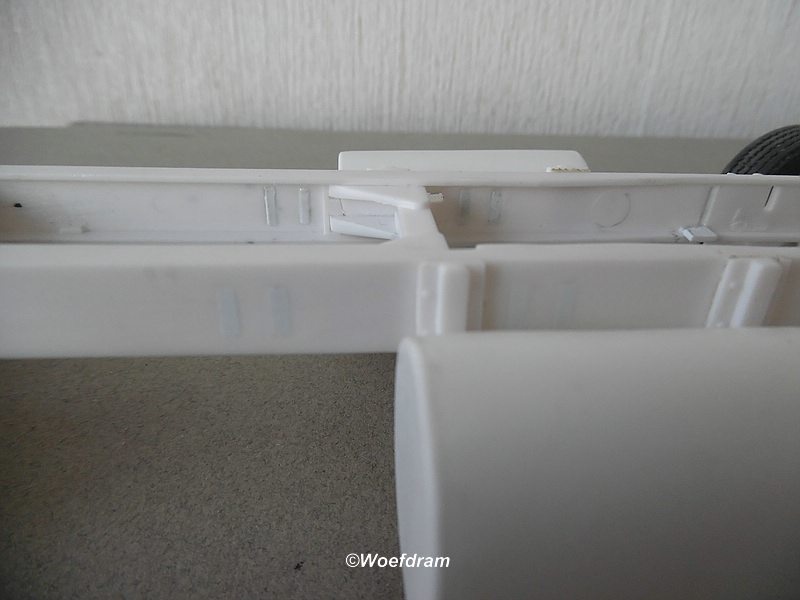 The recesses of the tank supports in the chassis are also filled up, because the fuel tanks are getting a different place on the chassis. 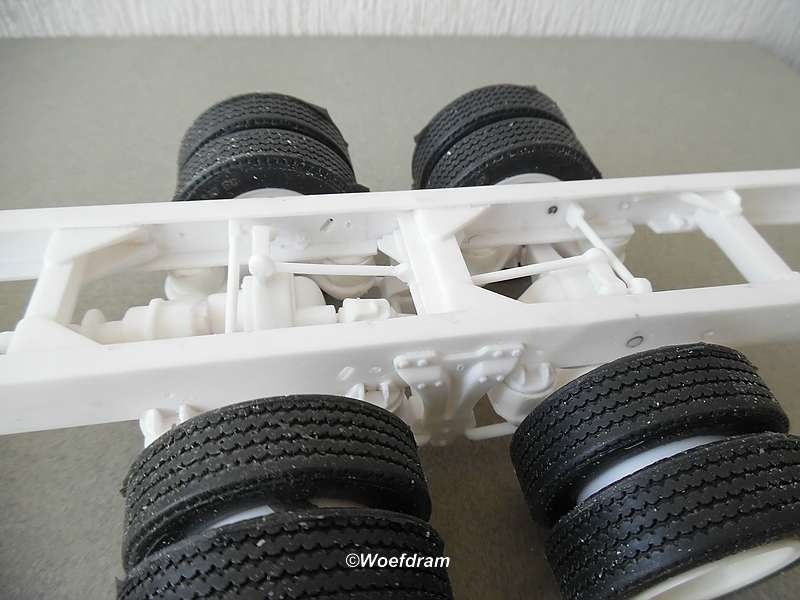 Now everything is in place, glue everything on the chassis , except for the front axle, because it still has to be neatly finished, put the recentley ordered tires on the rims and let's take a walk around the chassis. In my opinion, the chassis is now at a good height. 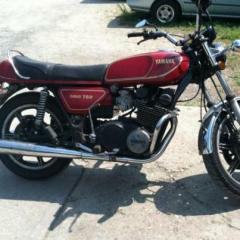 Today its time for the engine. First of all, i searched the net for a Cummins engine, and after a lots of pictures, i choosed the Cummins 350 Big Cam. 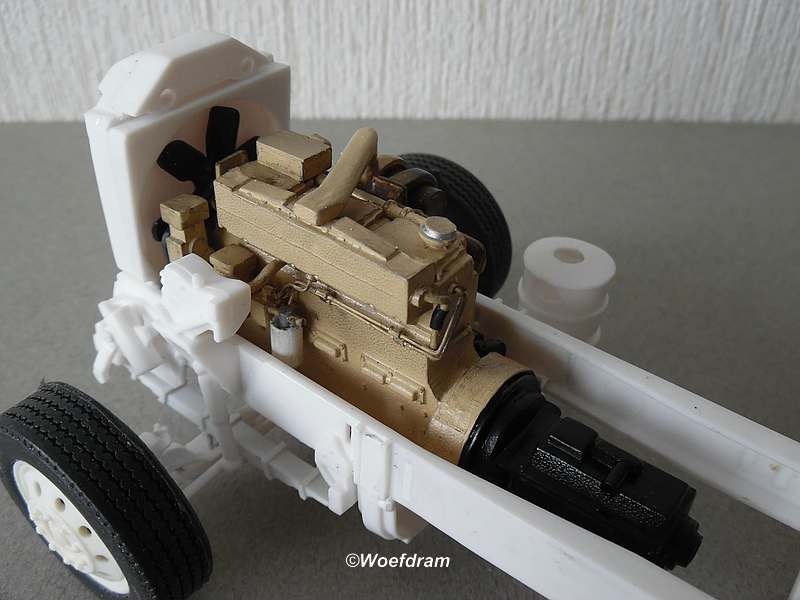 In my opinion, this is a credible engine for this Marmon, and with these pictures i start to modify and detailing of the kit engine. 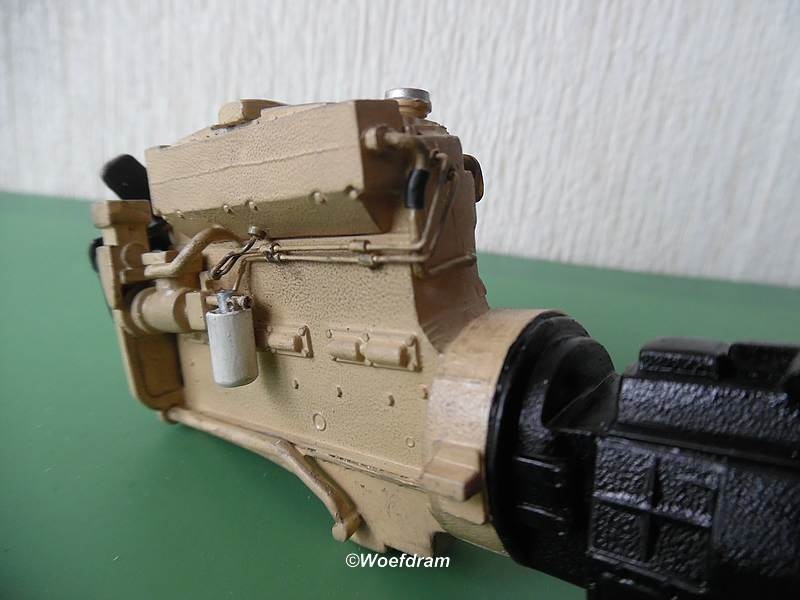 After all this work, i painted the engine with Revell SM314 and made a slight weathering and some dirt on the engine. 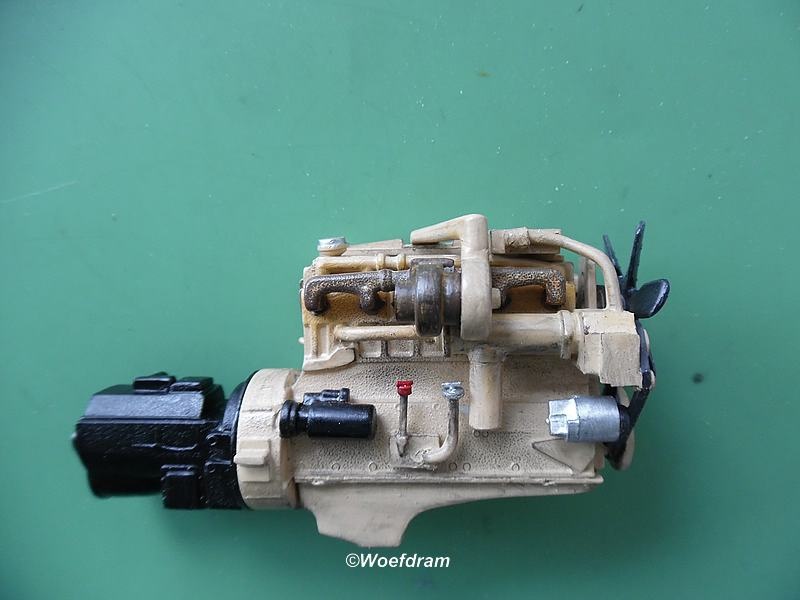 Because of the light, it seem to be 2 different engines with 2 differnt colours, but it is one and the same engine. 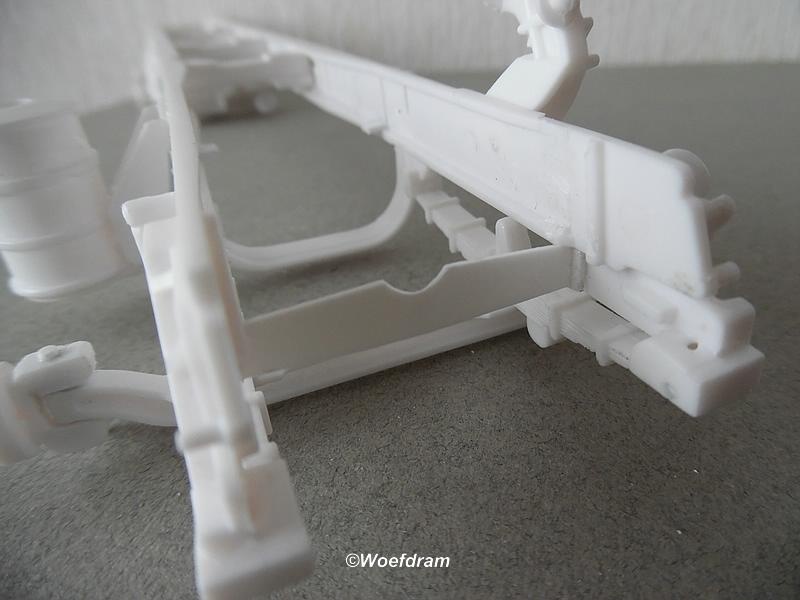 And put the engine between the chassis for the looks. That's all for today, to be continued. Amazing details on your build..
Wow, that's some serious talent building this beast. Love your work so far. 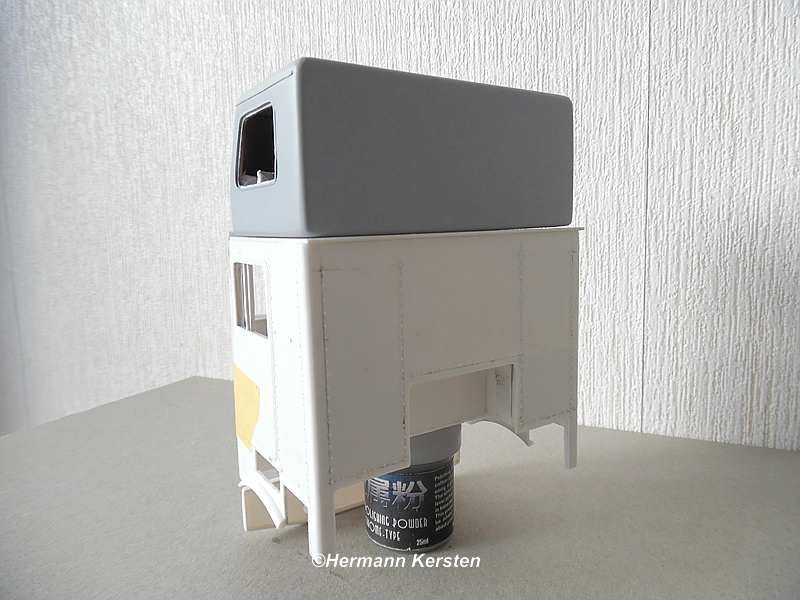 Hi Hermann, still following the build with interest, its looking good, looking forward to seeing your work on the cab and other details. Thanks for the encouraging comments guys! 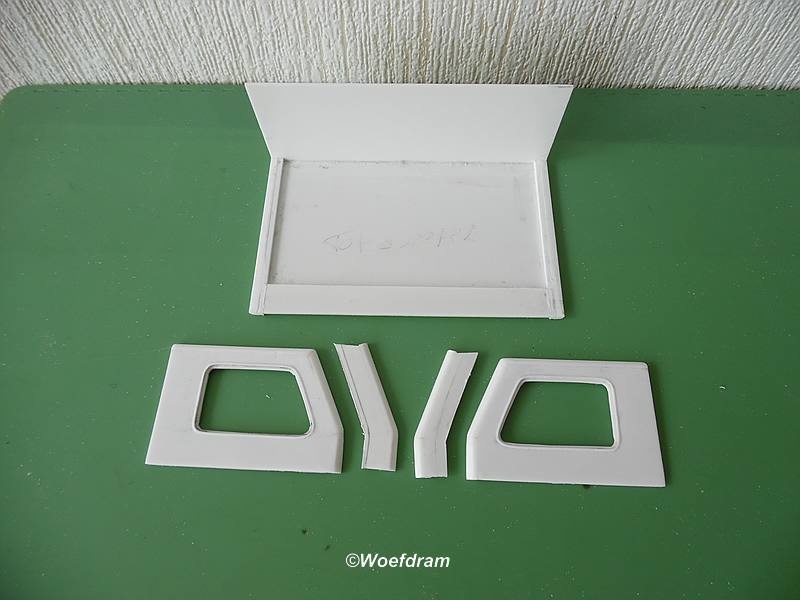 Yeah, i made a little mistake with the floor plate. 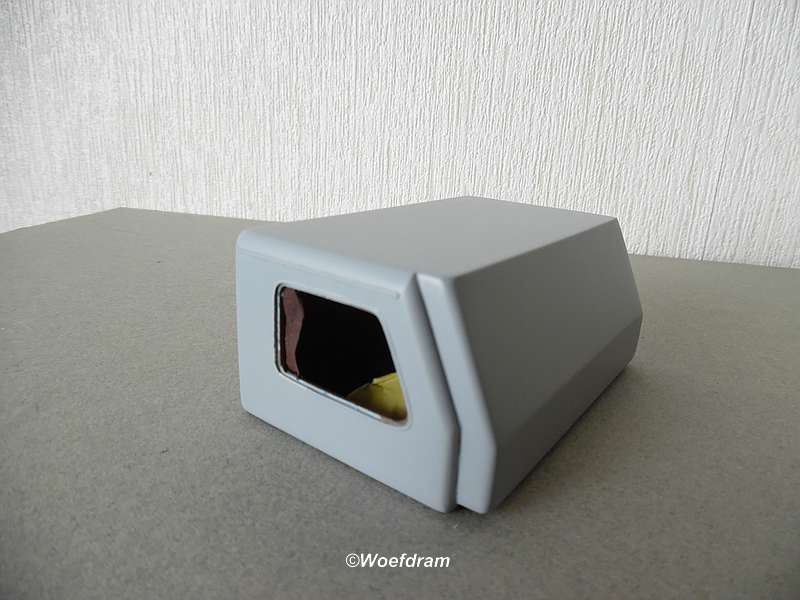 I forgot to make the recess for the gearshifter and to adjust this on the existing floor plate was not realy an option. 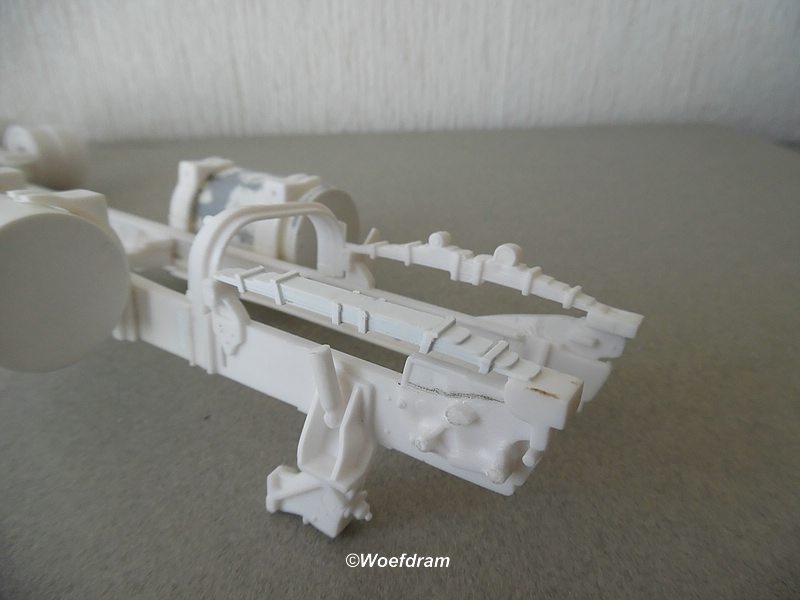 But hey, in the absent of good referenz material, this kind of things can happen......its just plastic. Her the new floor plate with the recess and the start of the dash. 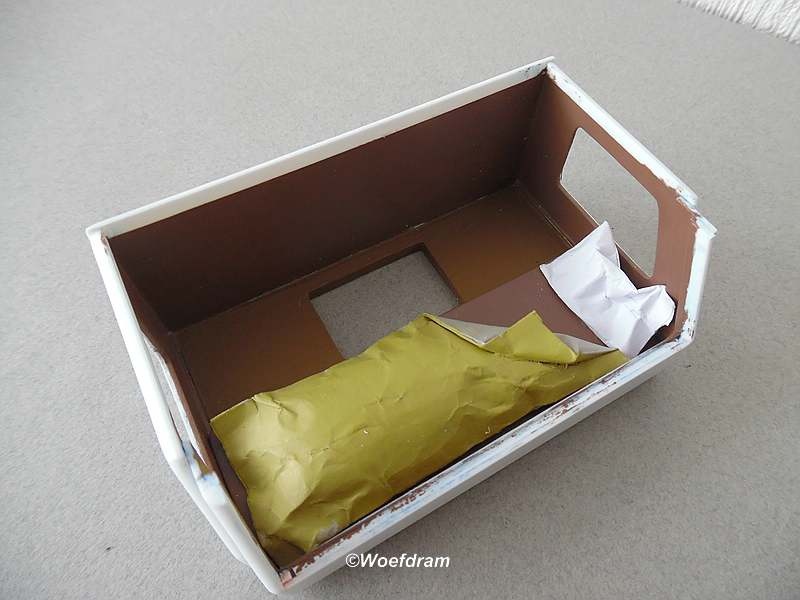 The driver seat is attached with double-sided tape to show the proportions. 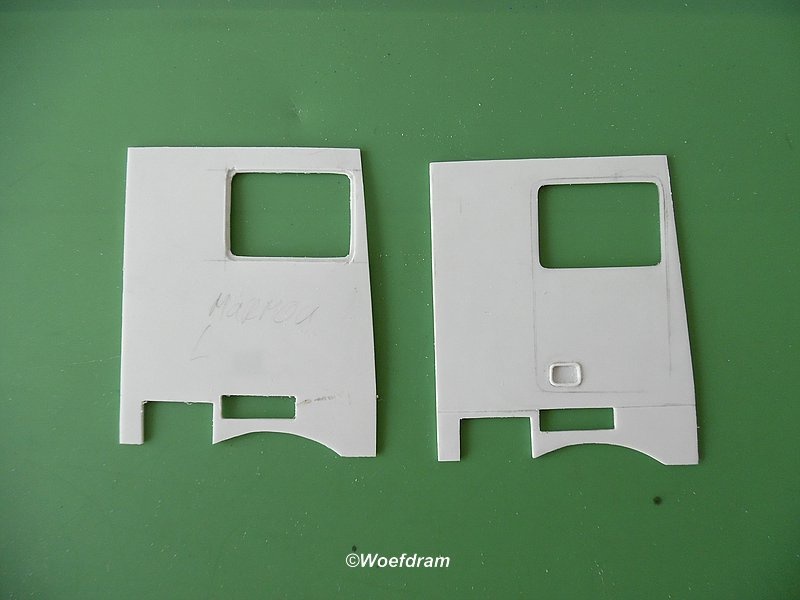 Now I am still wiating for the order of the punch & die set, to make the rivets on the cab parts. 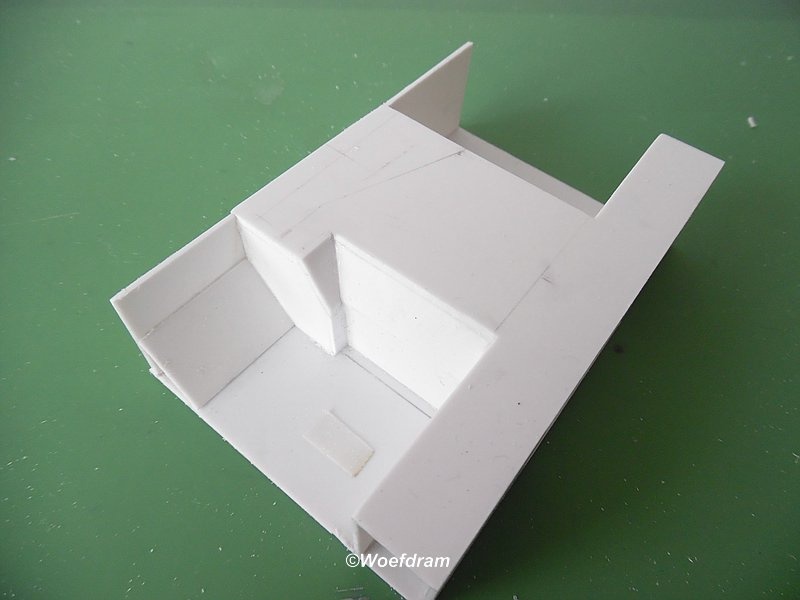 Until then, I can not yet assemble the cabin, but there is enough other things to do. 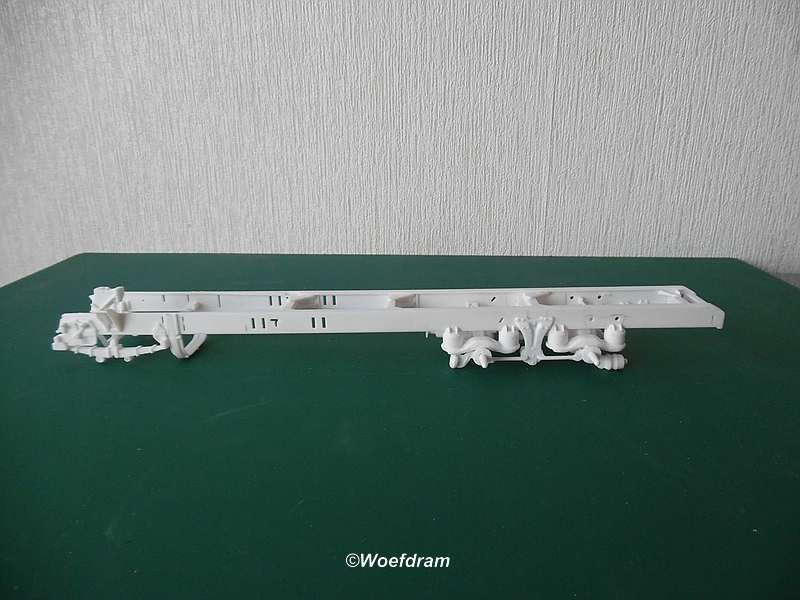 Next job was to make the sleeper, for the dimensions I could only fall back on the 2 pictures, what is a little difficult to determine the measurements from a perspective photo. With some measuring tricks and on sense of proportion I could then still determine the sizes . On later term comes in this frame the glass with a black window frame on the glass. 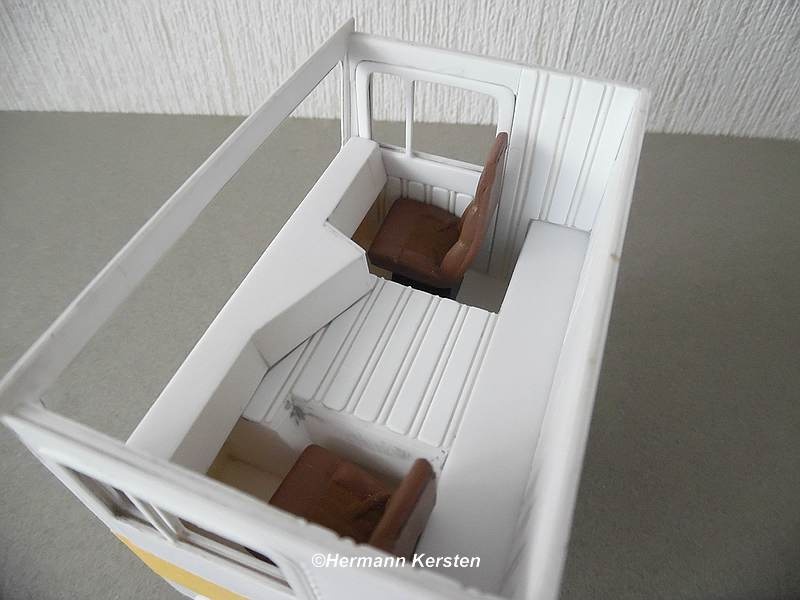 And the topsleeper placed on the resin cabine to show how this all together will look like. 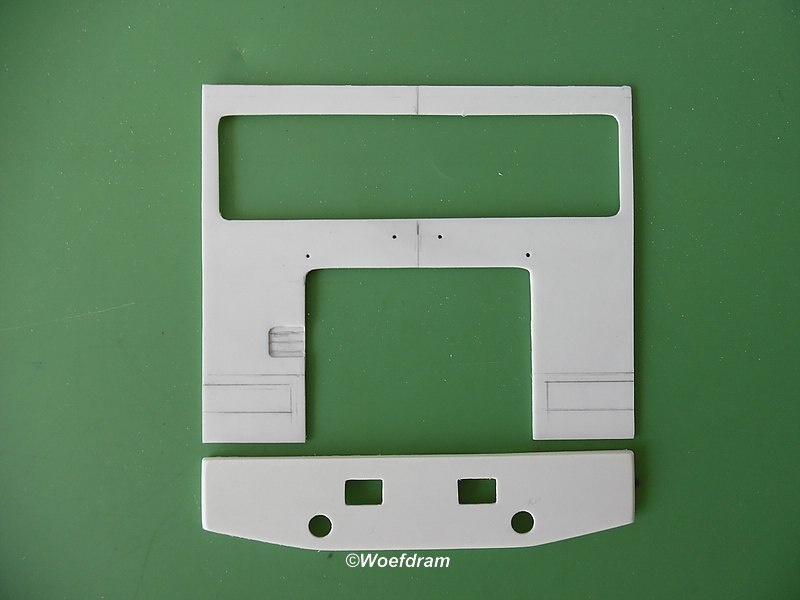 The slanted front plate is not fixed yet, i place it only for the pictures. That's all there is for today. 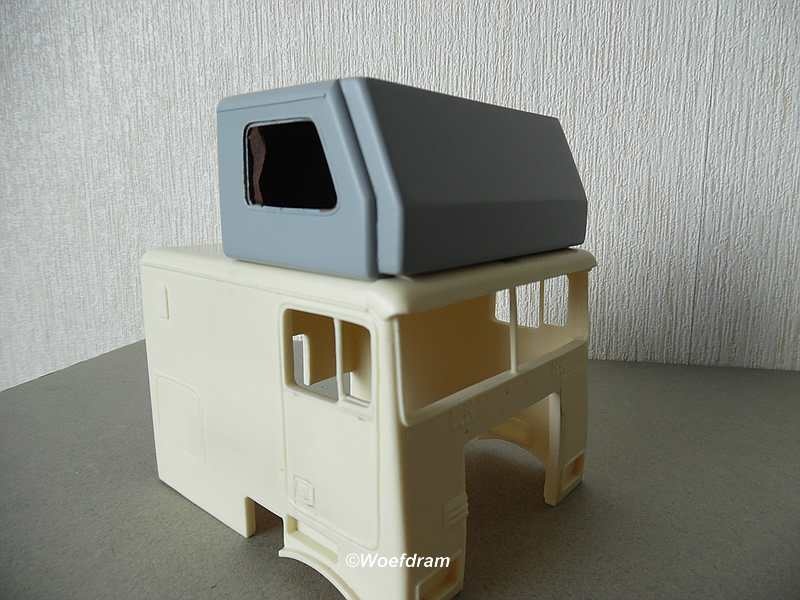 Today i show you some pictures before i'm closing the sleeper. 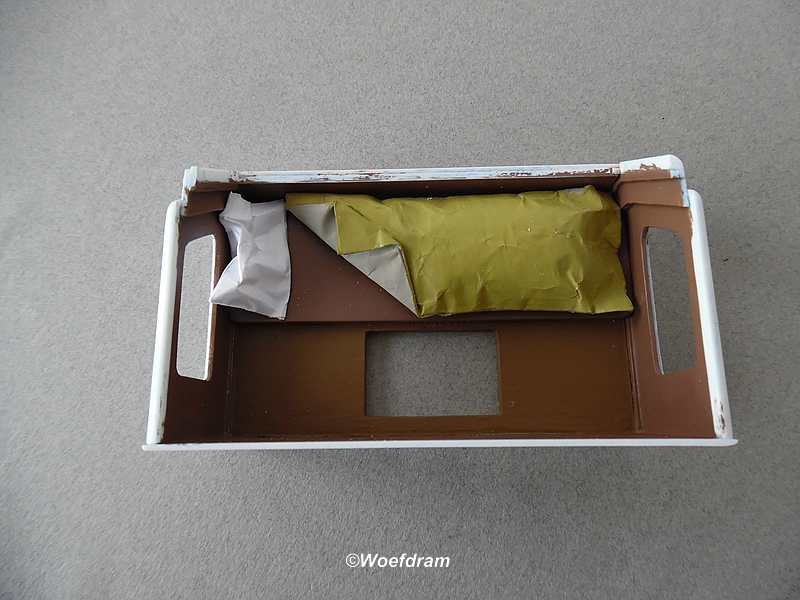 First i had to paint the inner side, becouse after closing i can't , of course, reach anyrthing anymore. I choose I chose brown tones instead of blue tones. 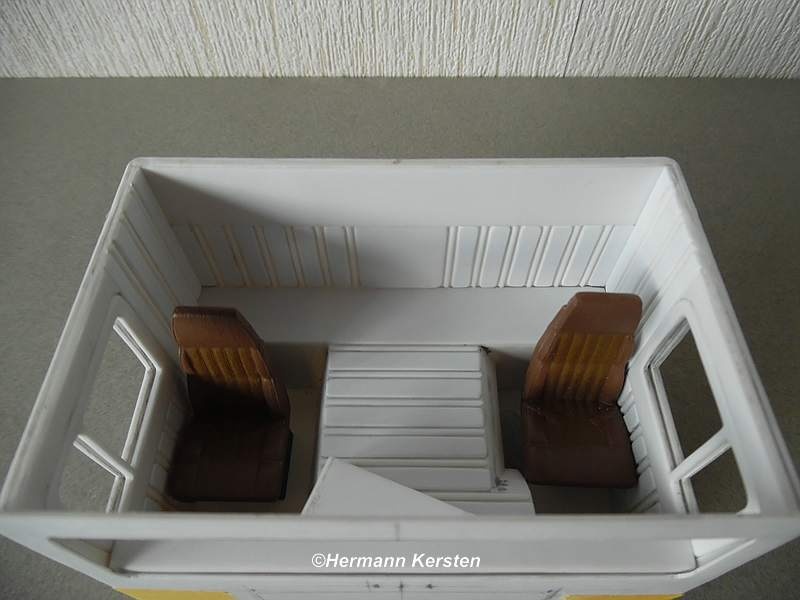 The reason is, because the blue tones get very dark, also later in the cabin, so that you will eventually see very difficult or few details inside the cabine. In this case, the restored Marmon on youtube was my example and chose the colors that most closely approximate the real colors. 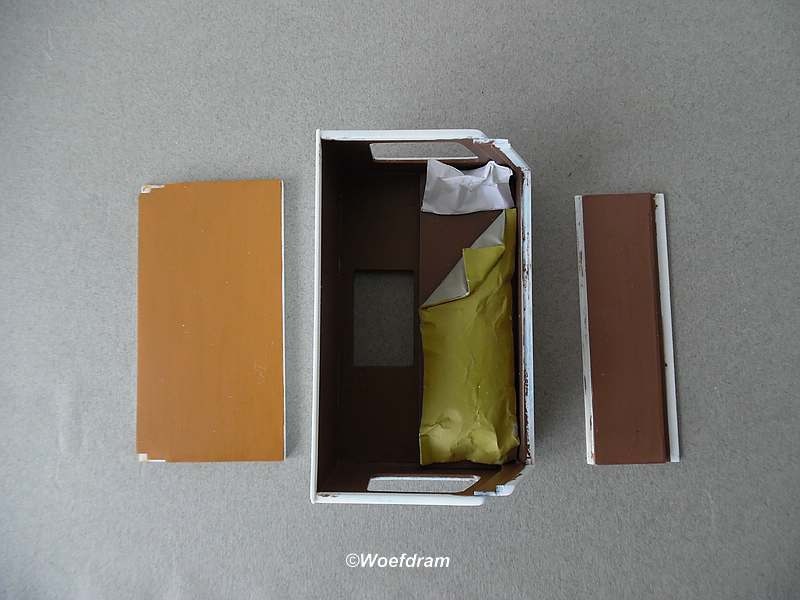 When the cabine is sprayed dark blue, then, in my opinion, the brown colours will give a nice match with the dark blue cabine. After the painting i made a bed with a pillow and a down comforter, which is all made of paper and filled with fluffy cotton. Why a down comforter??? ?.....I suddenly got a song in my head what was sung by Doug Ashdown ......."winter in America is cold" . 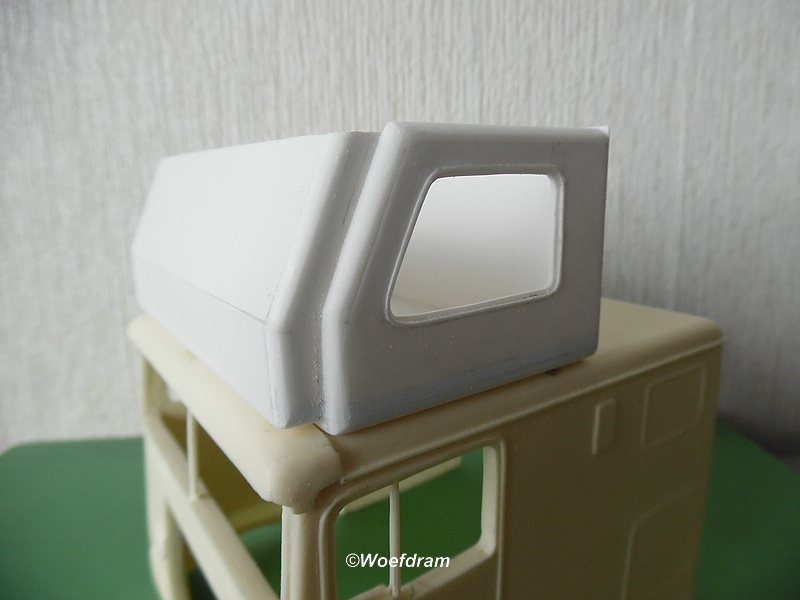 Next job is to close the sleeper. 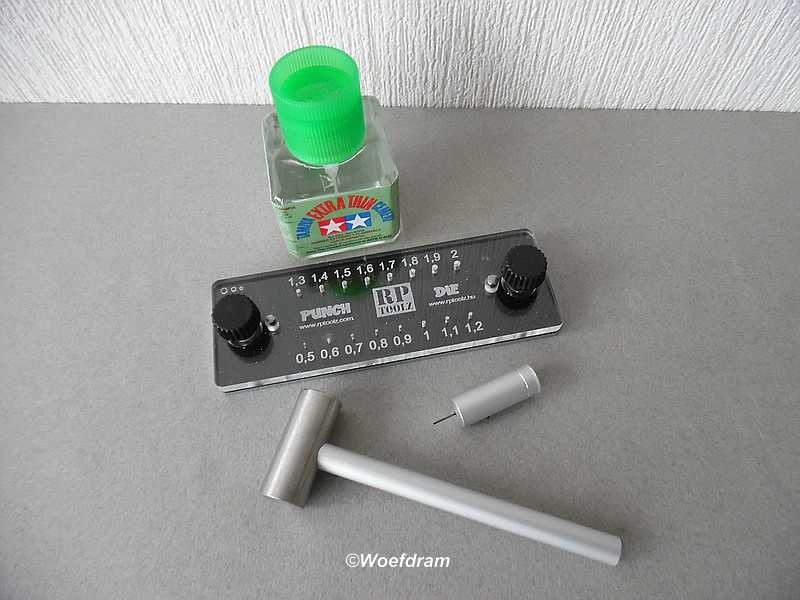 I have also good news, the Punch & Die set is coming one of these days and than i can finally start working with the rivets on the cabine. Holy Moly Batman ! What a fantastic project ! 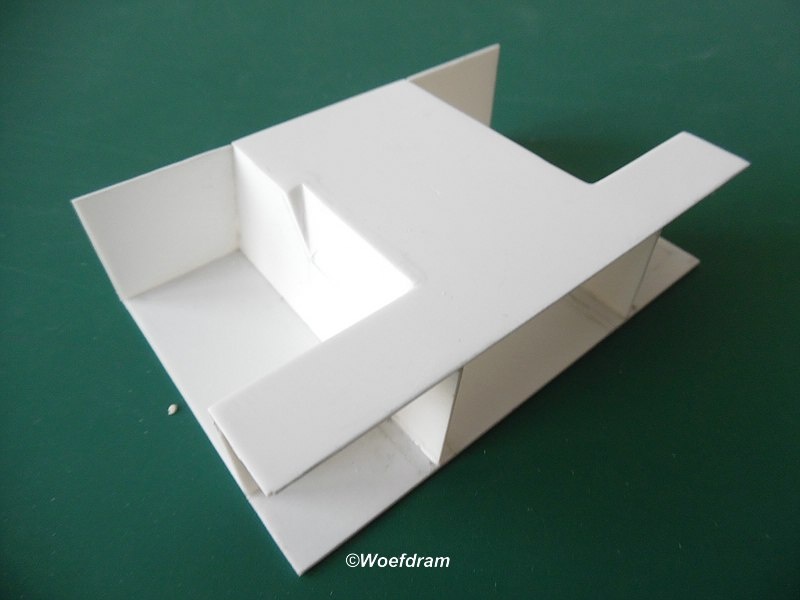 Awesome scratch building and fabrication ! Thanks for theenthusiastic comments gentlemen! 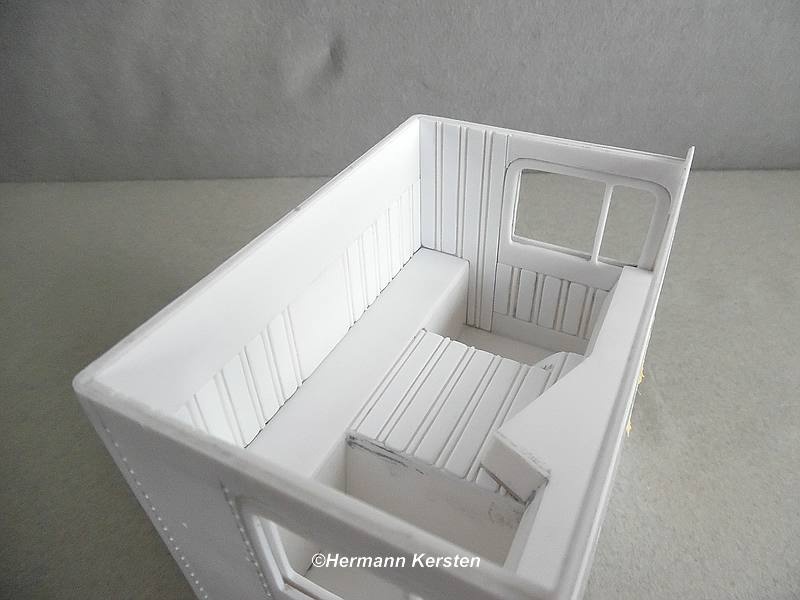 Today i show some progress on this Marmon. The Topsleeper is done now, except the blue paint afcourse hahahah. 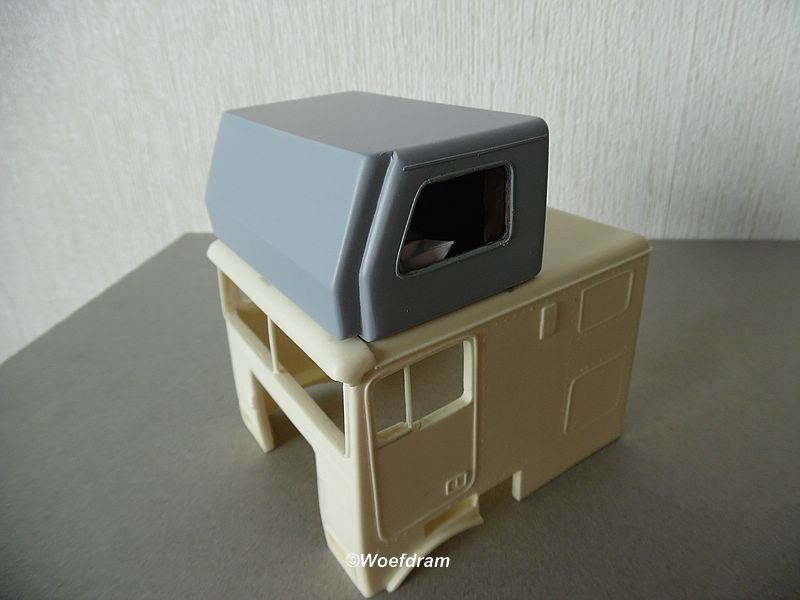 Everything is closed put some curtains in it and put the sleeper in the primer. After this i was looking again to the engine. The radiator has to be modefied, but it was a digfficult situation with the pipes for the aircleaner and turbo. 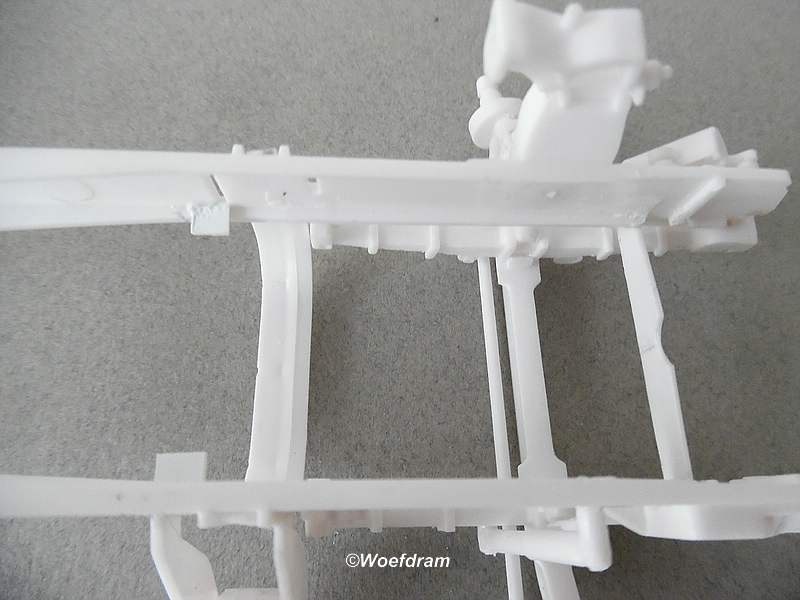 After some investigation of the pictures i have, i didn't see an airclaener on the side of the chassis. 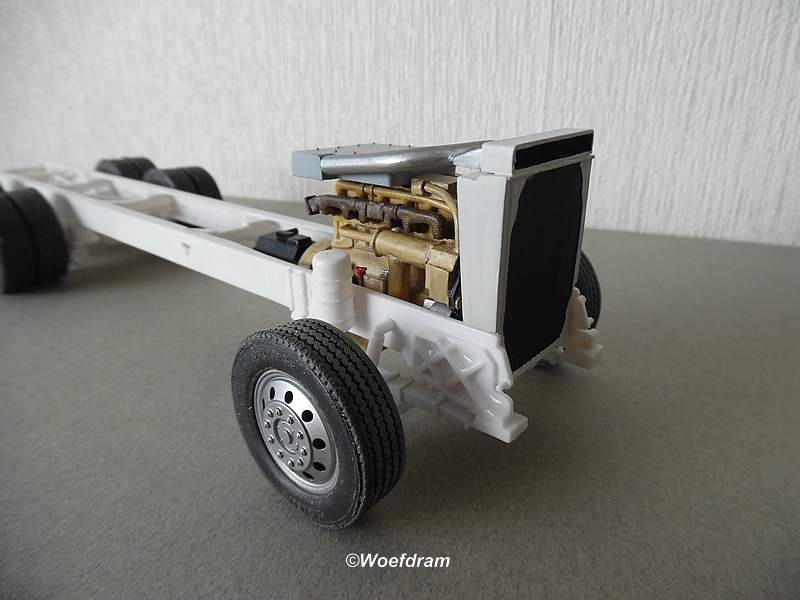 With this straight truck there is no aircleaner on the chassis, so i had to make this in another way for the air supply. 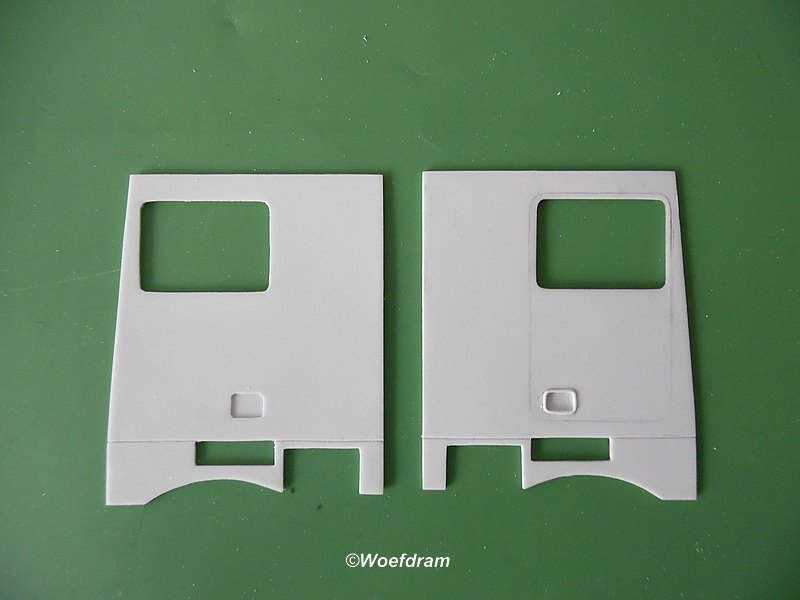 This time i choose the situation of the Freightliner, get some parts from the kit i needed, duplicate the parts with styrene and the problem has been solved. 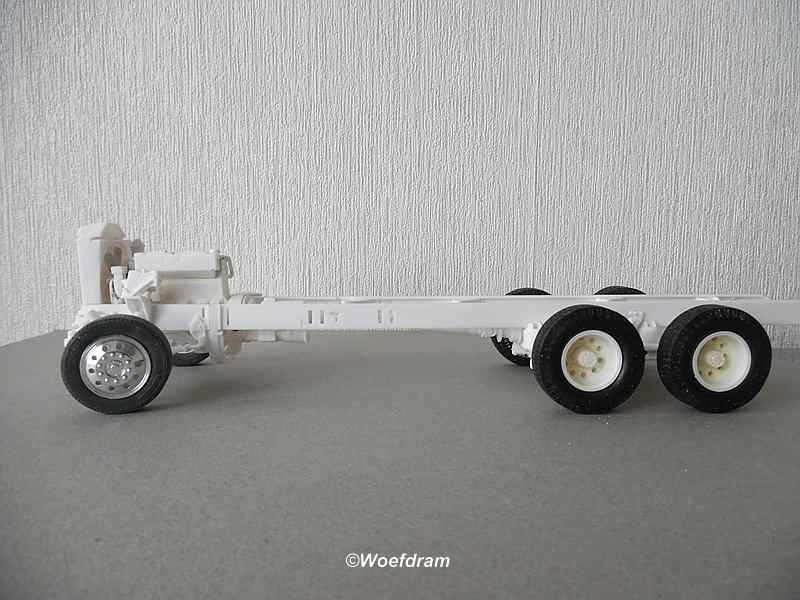 On the web i found some pictures of a Freightliner chassis with a cummins engine for sale, and this was the exact situation that i have now on this model. 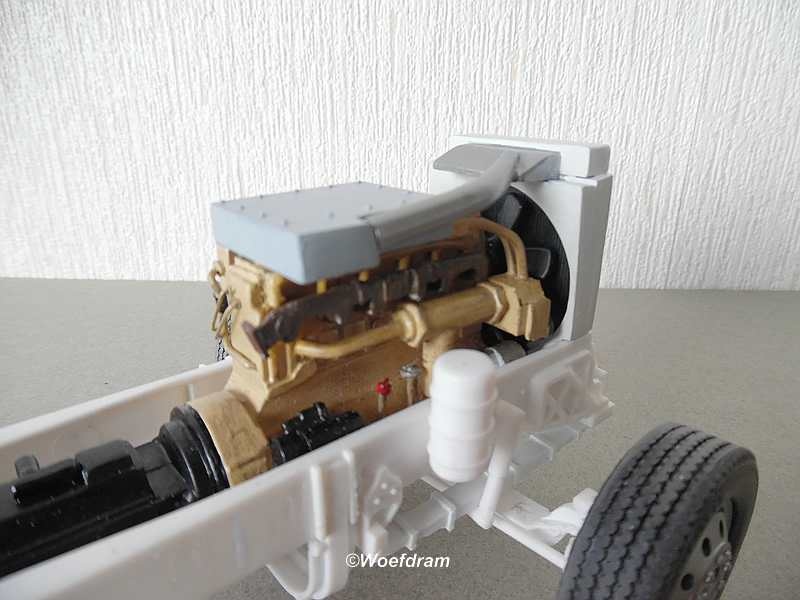 Also the colours of the radiator and airbox are shown, so that i can paint everything in the right colours or in any case a good approach. 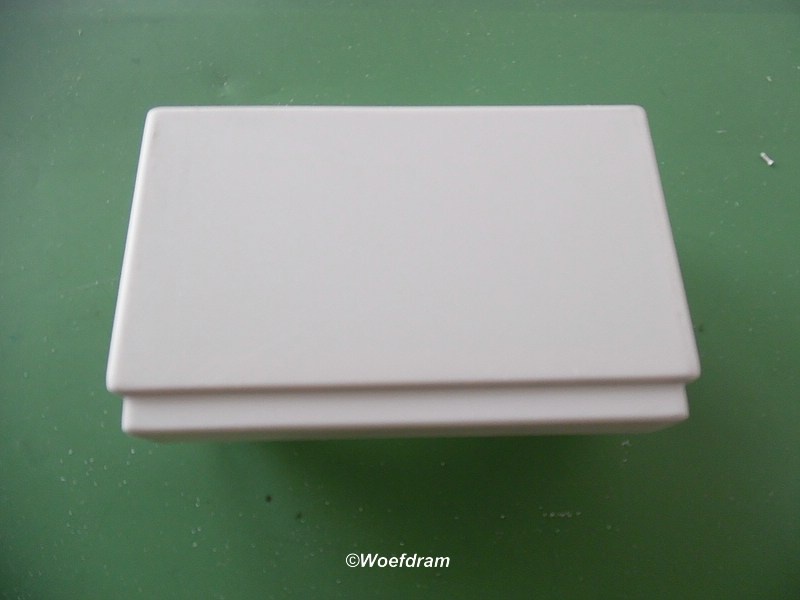 Than after waiting for the Punch & Die for delivery, for making the rivets, i started with the first cabine part. I took the size of the rivets from the AMT Freightliner and saw that these rivets are 0,6mm and from rivet to rivet the distance was 3mm. 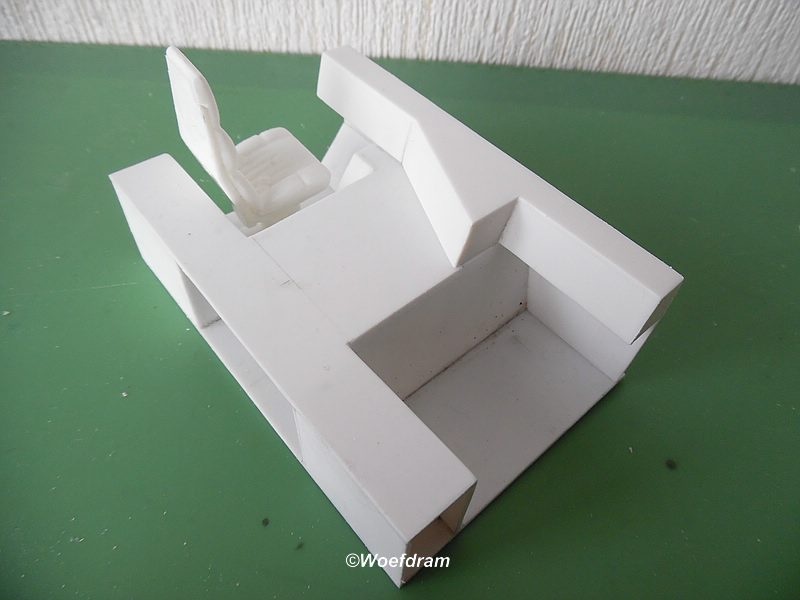 Ok guys, the start has been made, and that's how I first finish all the cabin parts, before i glue all the cabine parts together. Today some progress at this project. 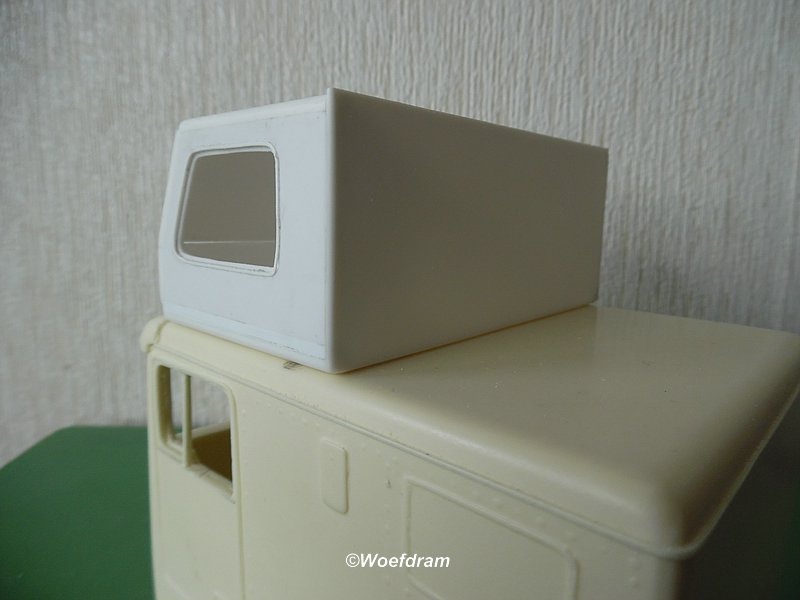 After some research, i found out that this cabine is too low. 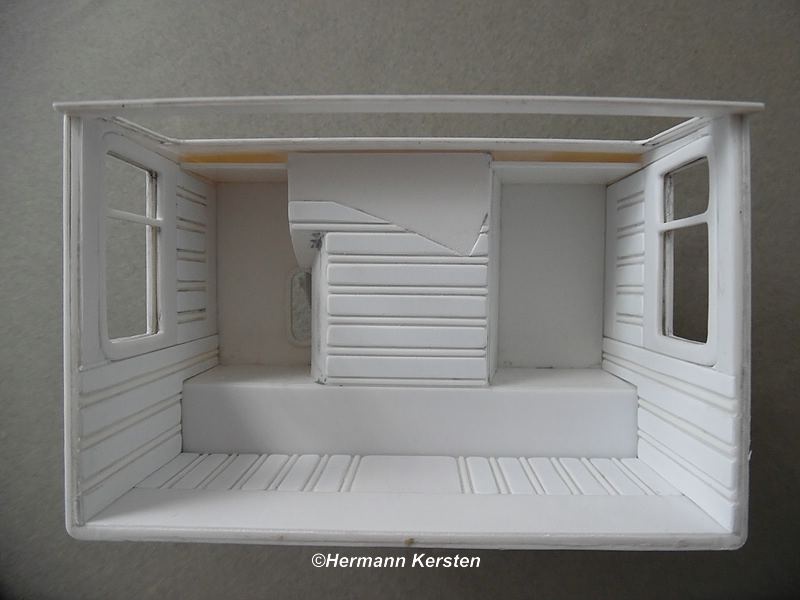 I had to extend the height by 4mm and this meant that I had to make the whole cabin all over again. 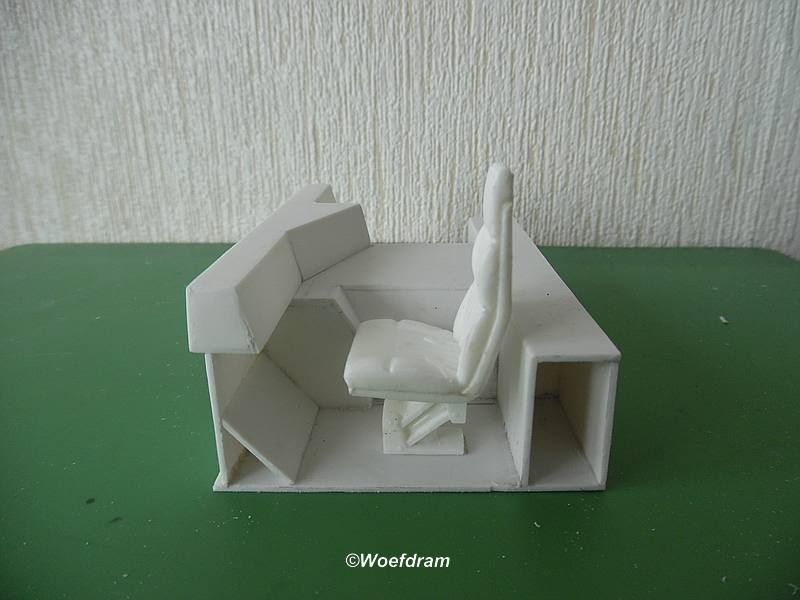 The good thing is, that this time I could avoid the small mistakes that i made at the first cabine. 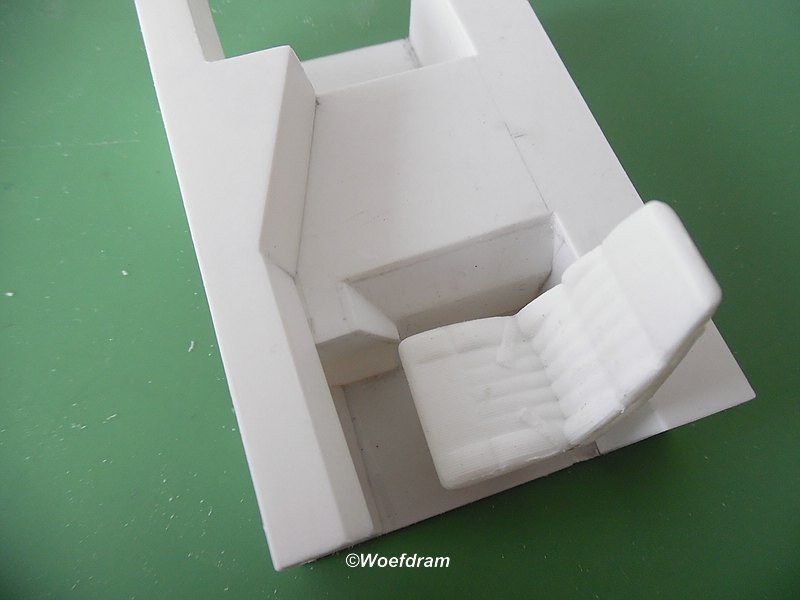 After cutting the new forms and glue them together, I continued with the interior. 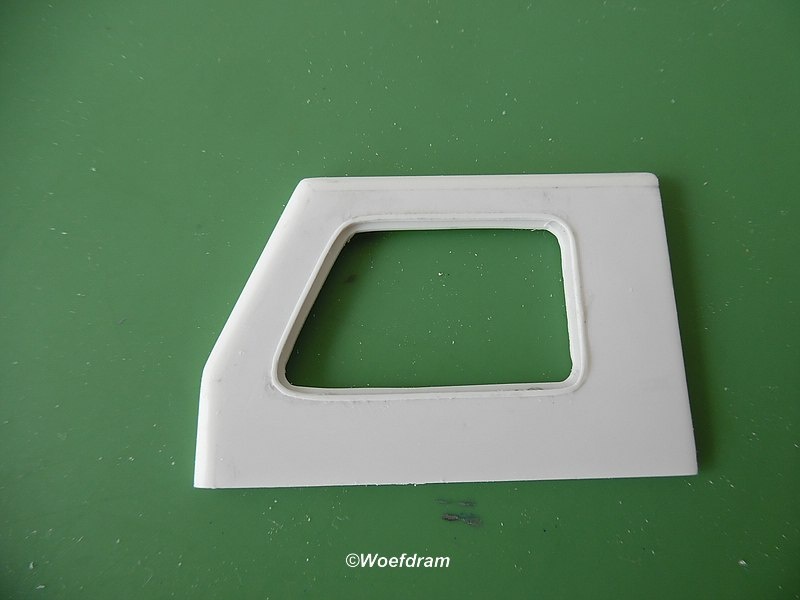 At rthe next pictures i show you the result after a lot of cutting and sanding of the seperate strips. Here under you can see the small space between the inner- and outer door. 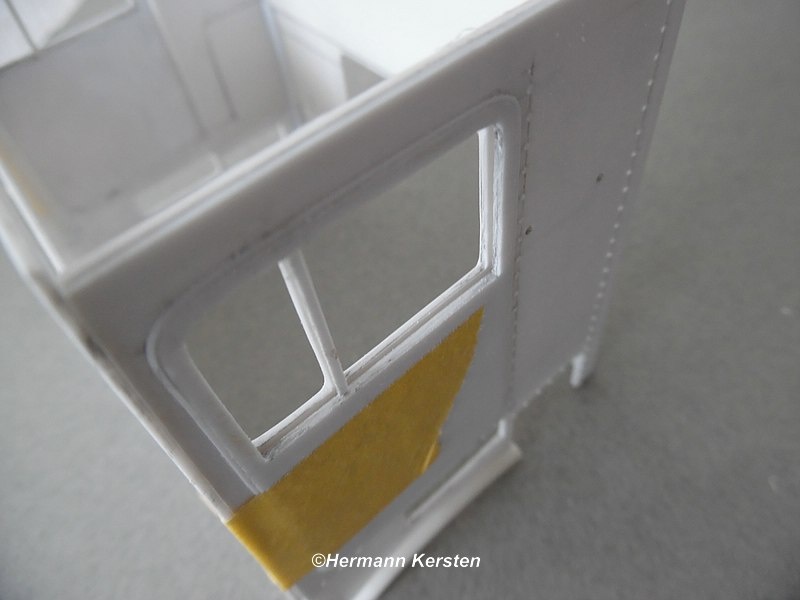 Later, after everything is sprayed in the blue colour, i can attach the 0,5mm thick transparent for the window. 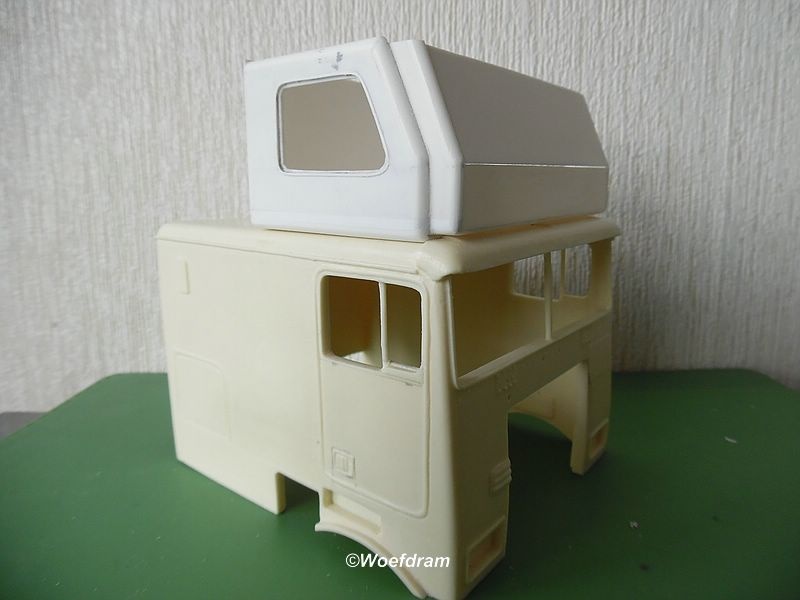 And together with the roof and topsleeper, what is not attached yet. Now it's time to finnish the roof with the same pattern at the inner side, and after this work the front plate can be attached. But more about this at the next update.